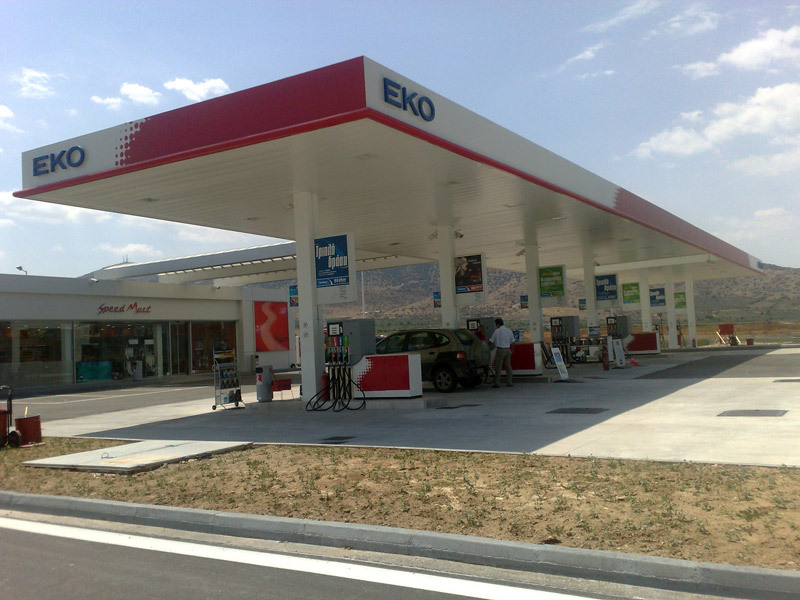 (EKO, BP, AVIN, CYCLON, ETEKA, TOTAL, MAMIDAIS, ELDA, etc.). 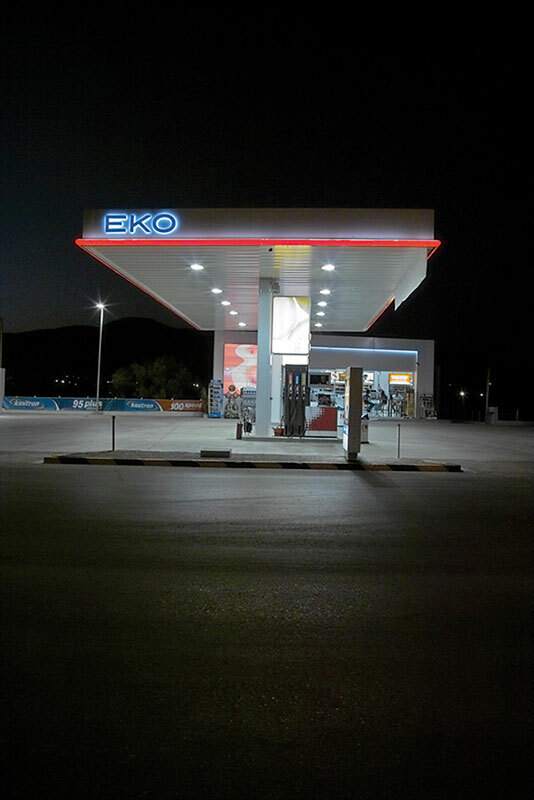 Starting at point zero and paying attention to the correct study and construction of a fuel station, we take on a project from the stage of issuing the appropriate Jurisdictional Approvals, up to the last necessary task for its launching. 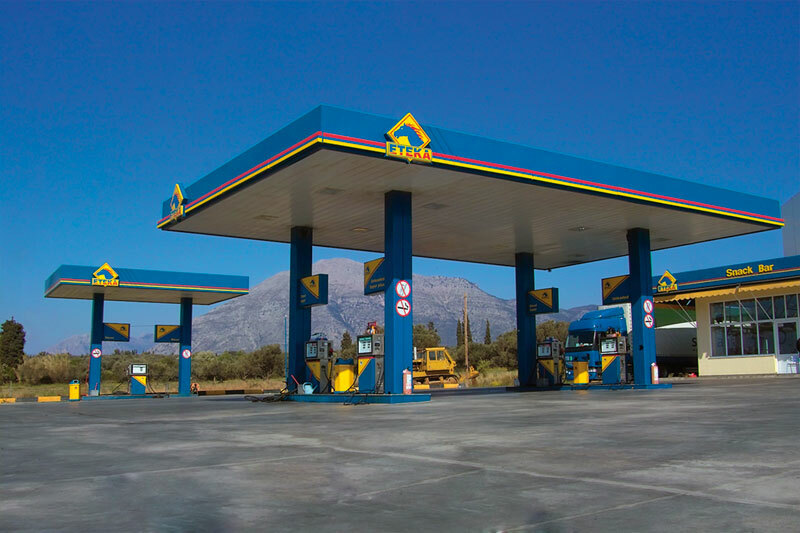 In a field of specialized requirements, ATEKE’s wide experience, obtained during the past 20 years, makes it the most efficient company in the challenging and dangerous field of liquid fuels. 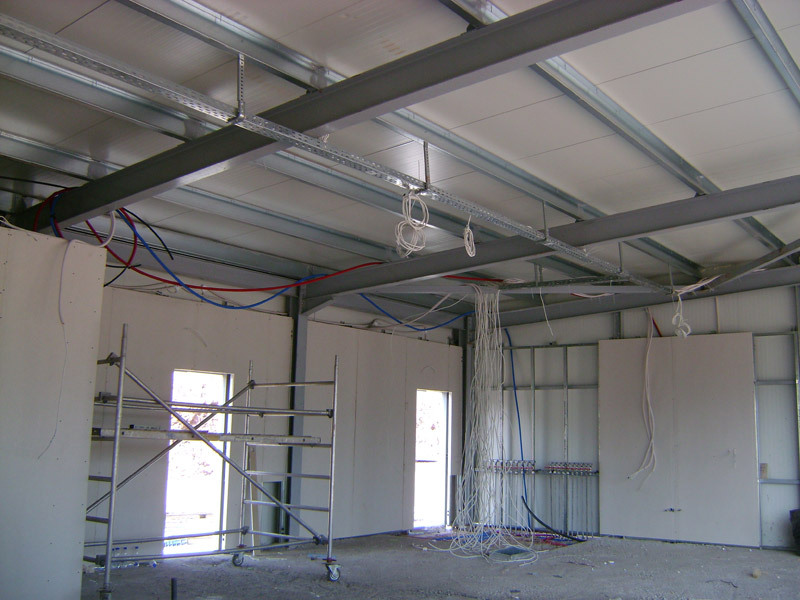 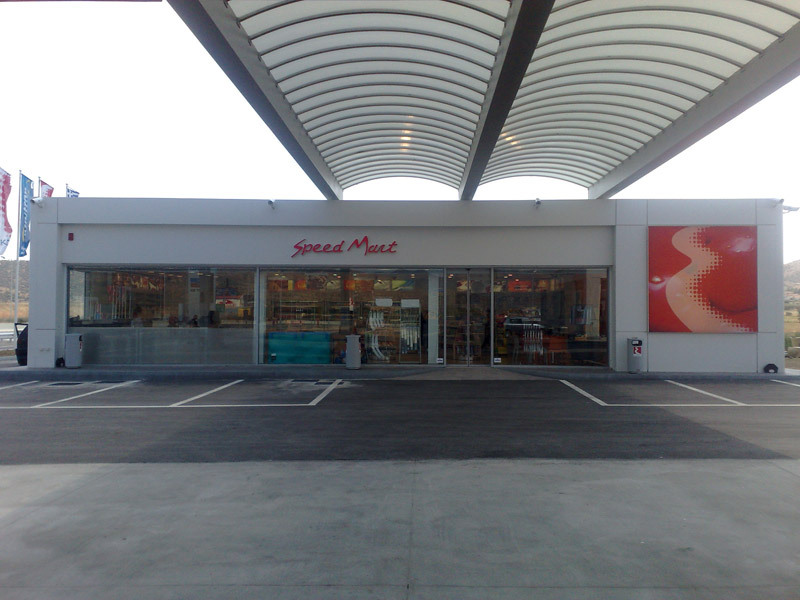 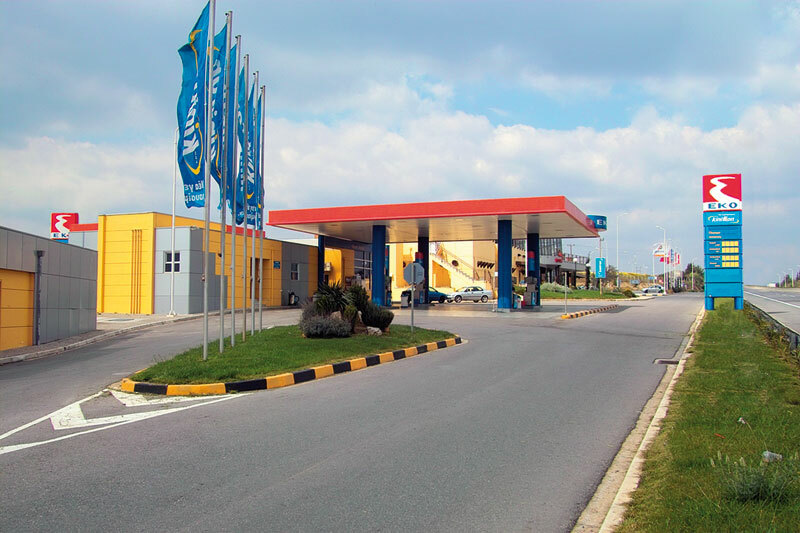 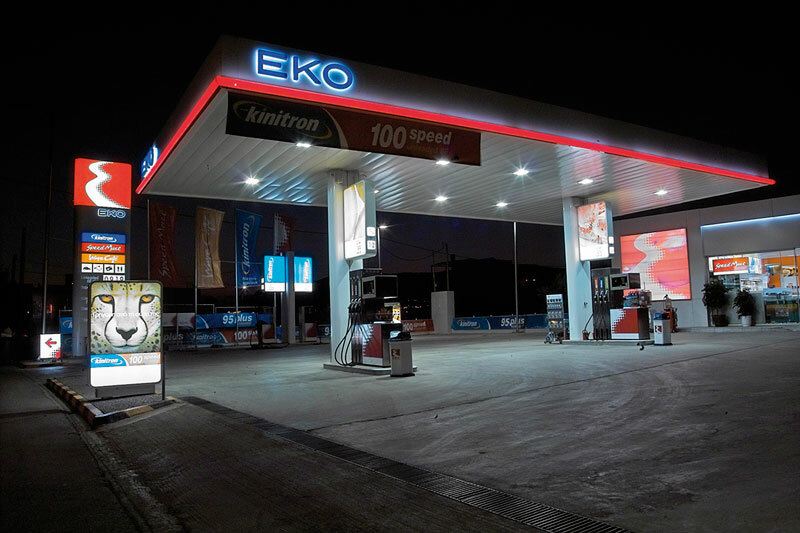 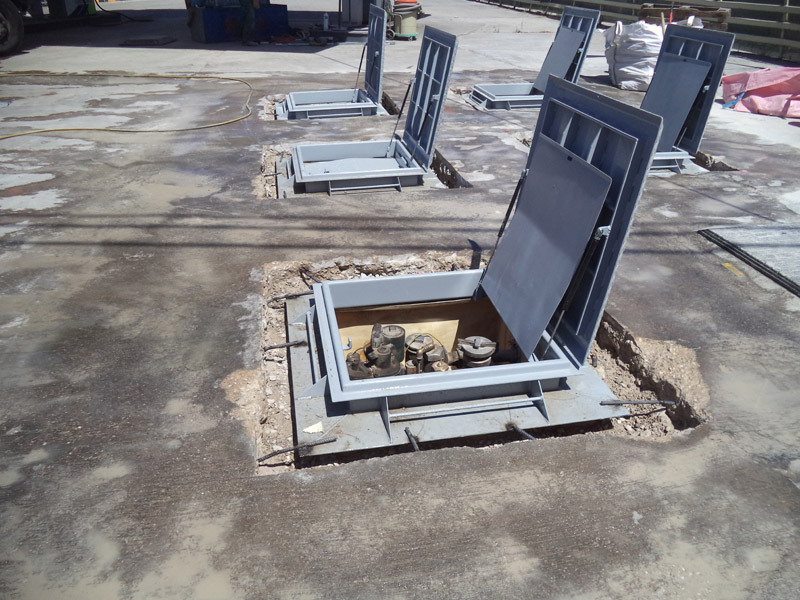 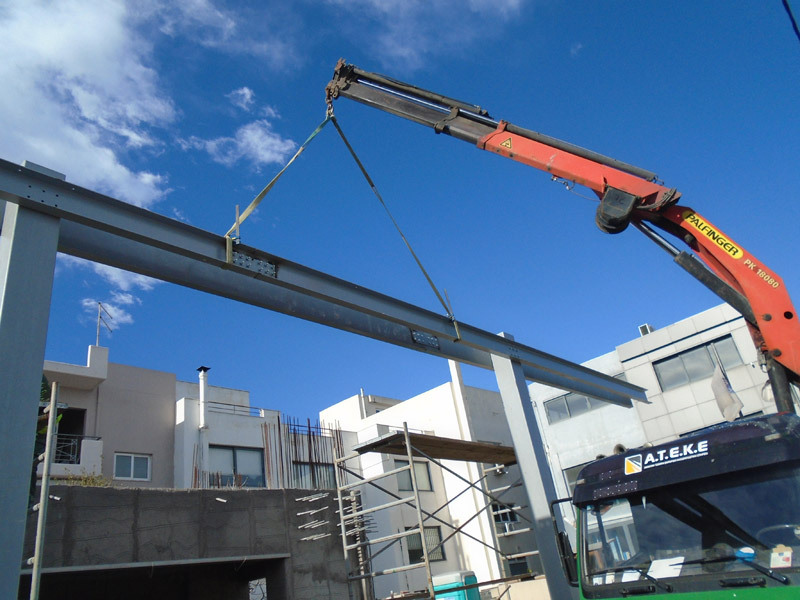 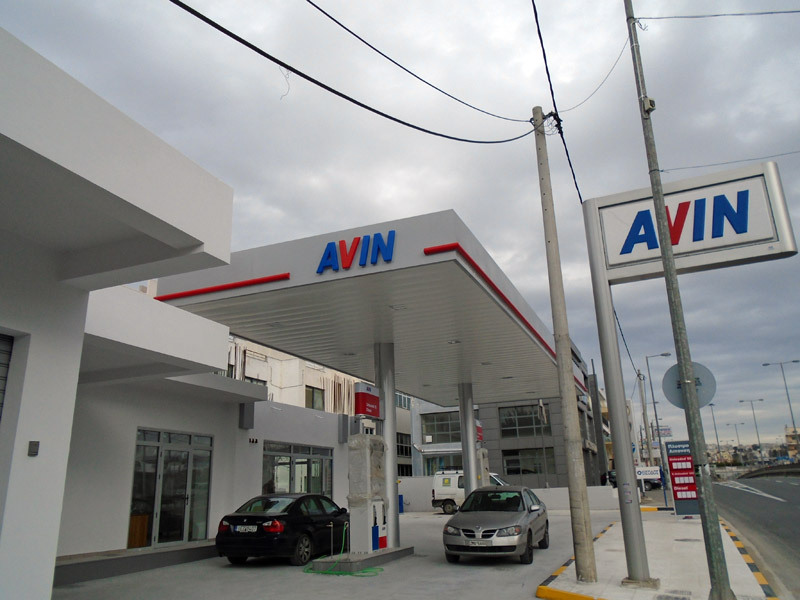 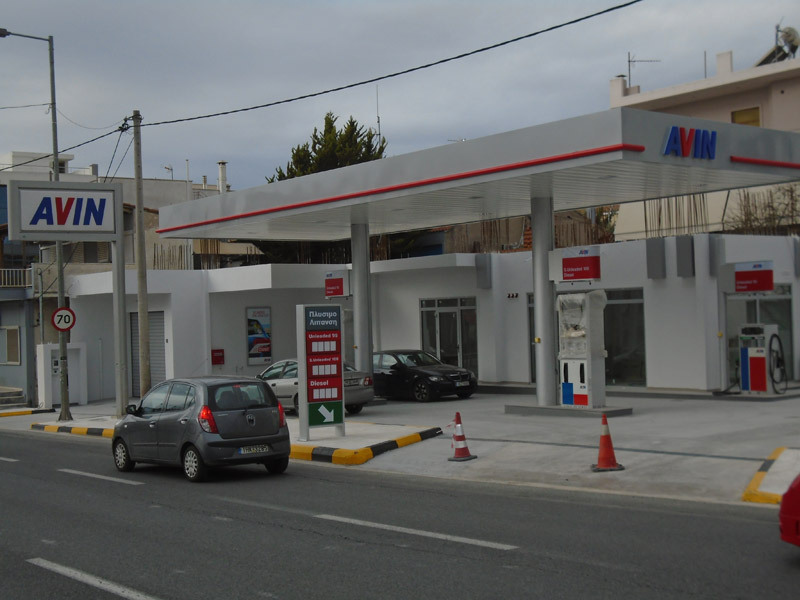 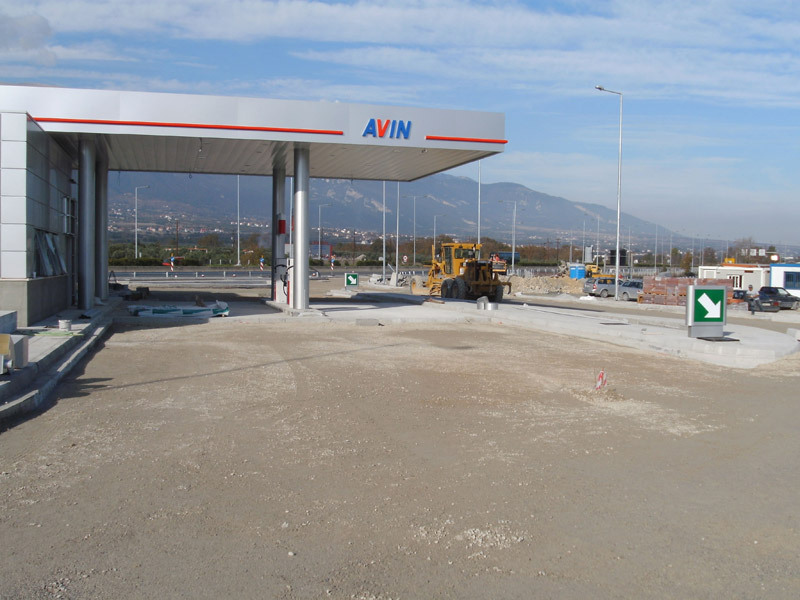 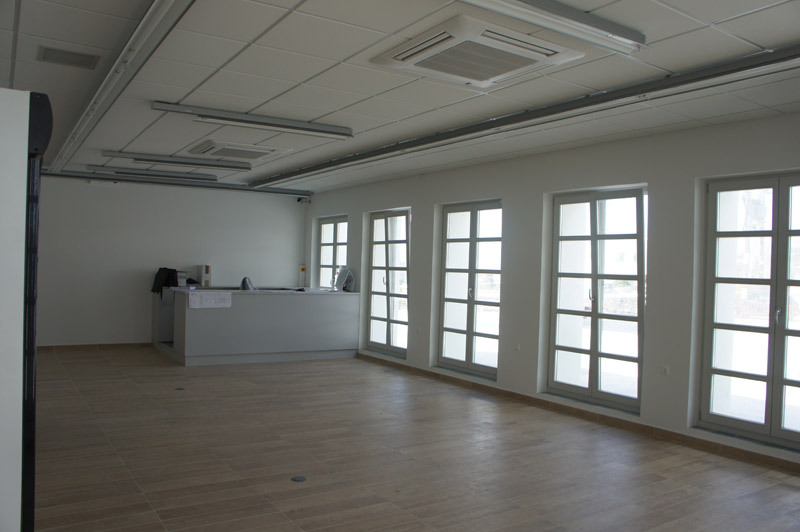 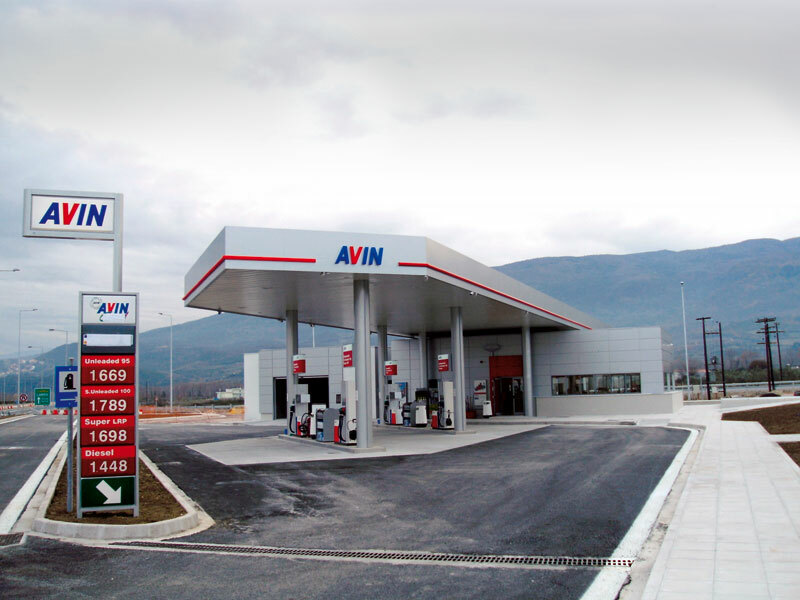 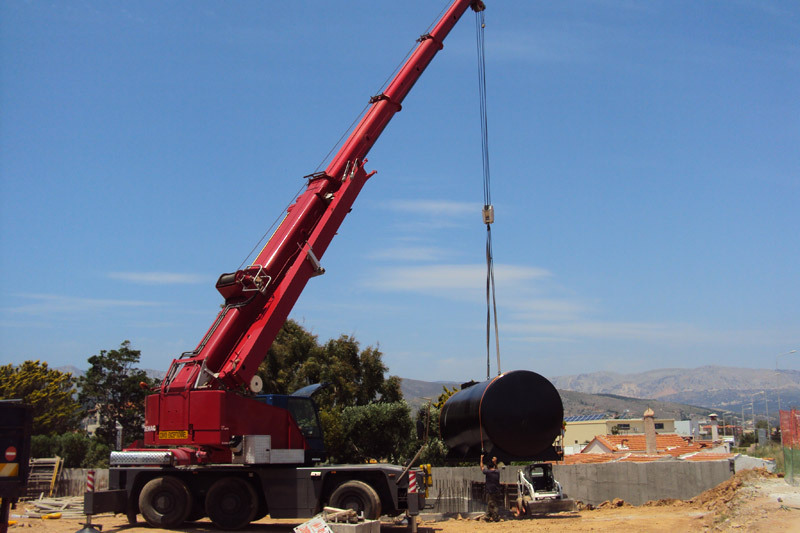 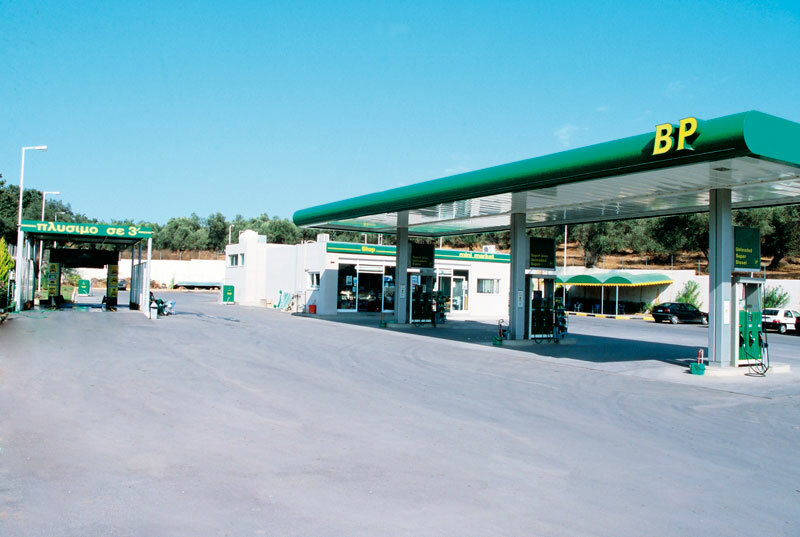 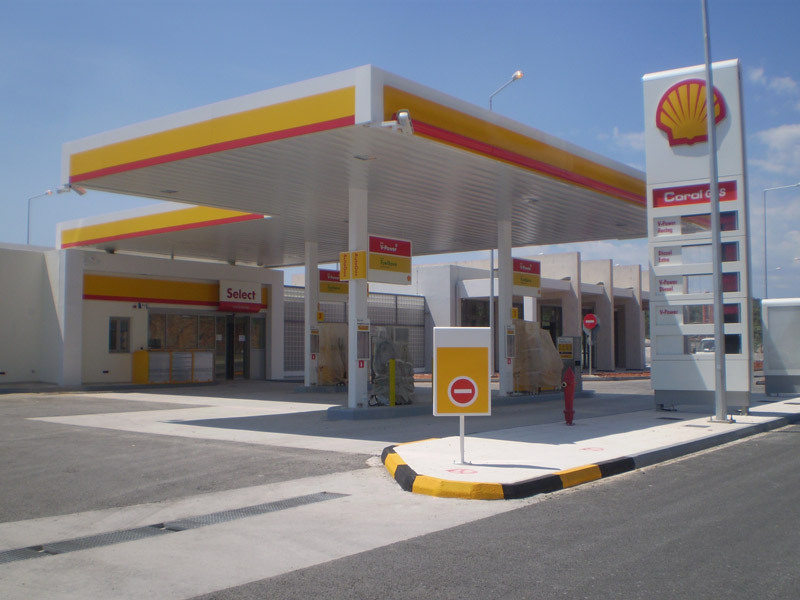 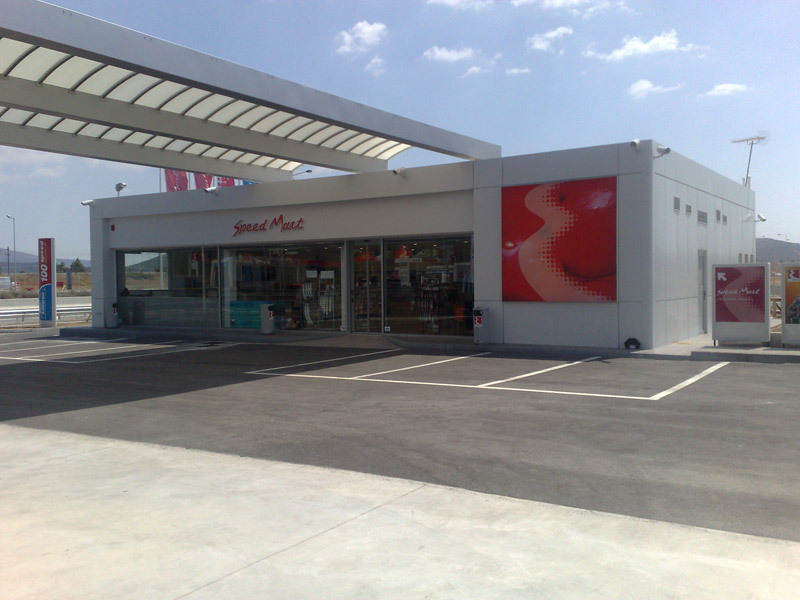 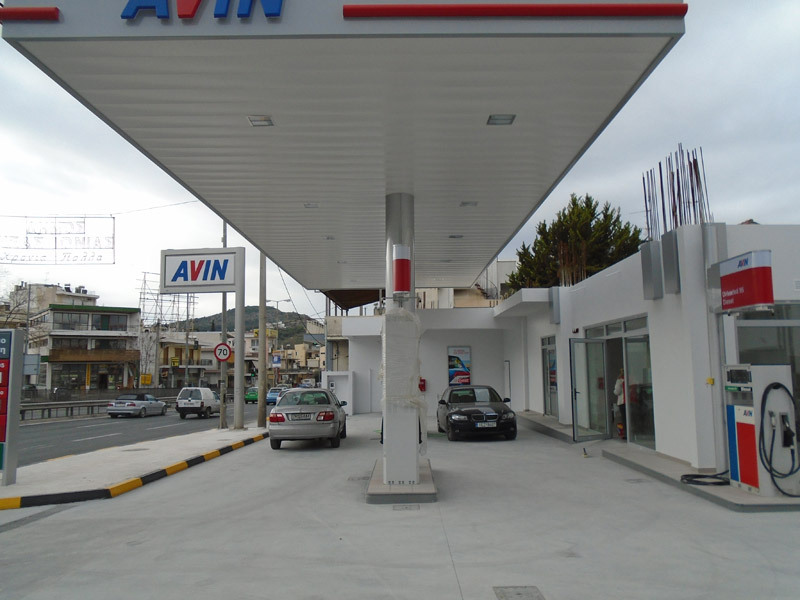 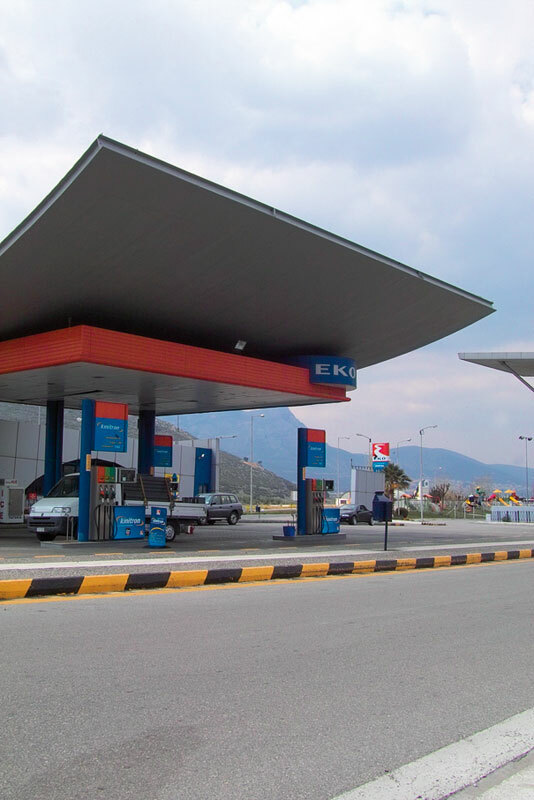 In February 2009 our company began the construction of the gas station of the SAR EVANGELISMOU in the NR ATHENS-THESSALONIKI, POSITION EVANGELISMOU in LARISA. 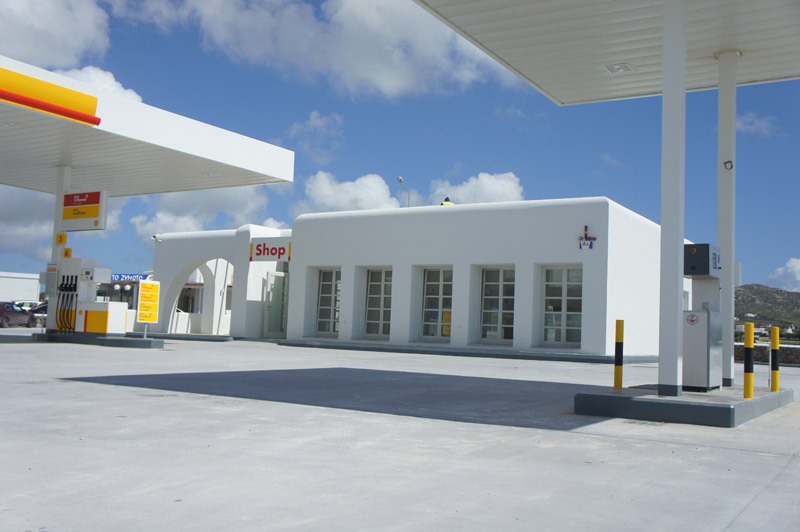 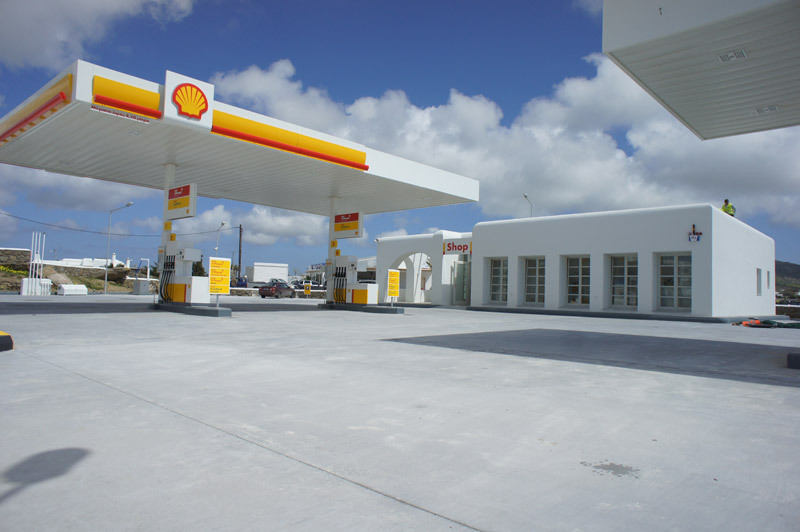 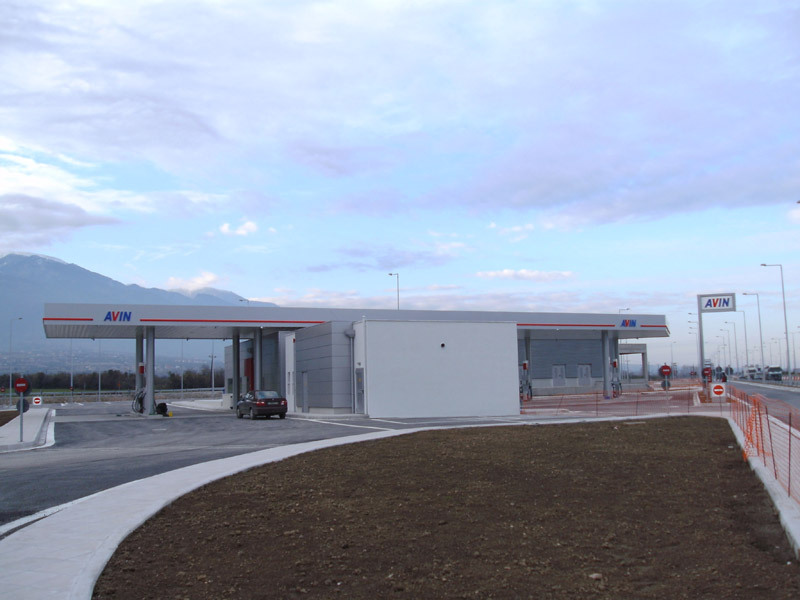 With a very tight schedule and within the minimum time assigned (55 calendar days), we constructed 6 metal constructions, the gas station, the car wash, the car service area and the metal awnings, covering a total area of over 800m2. 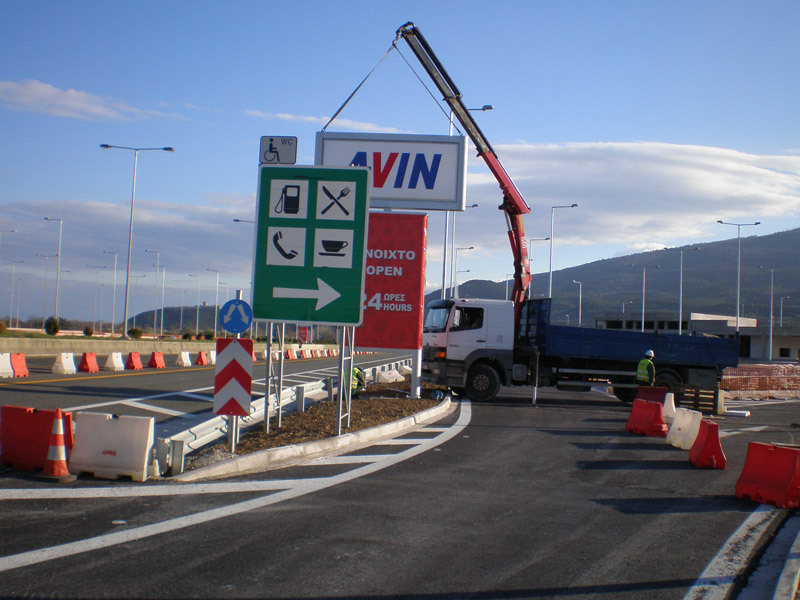 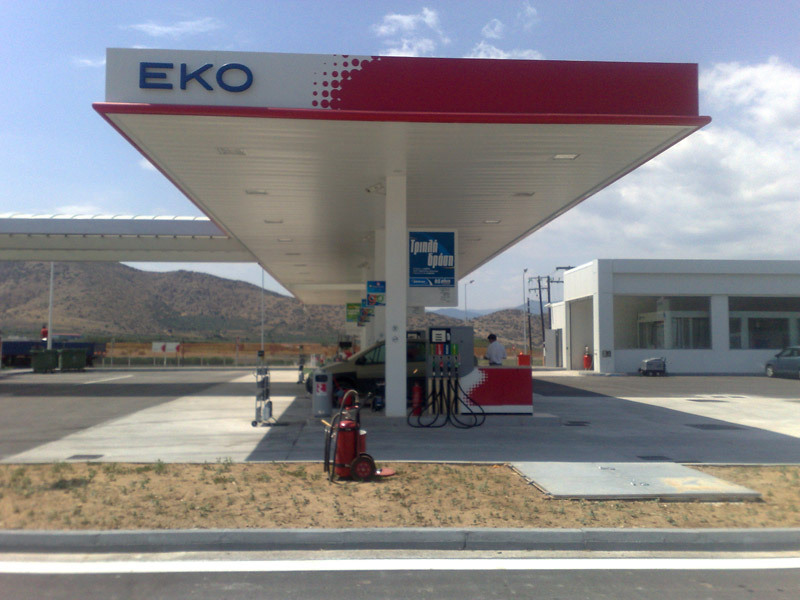 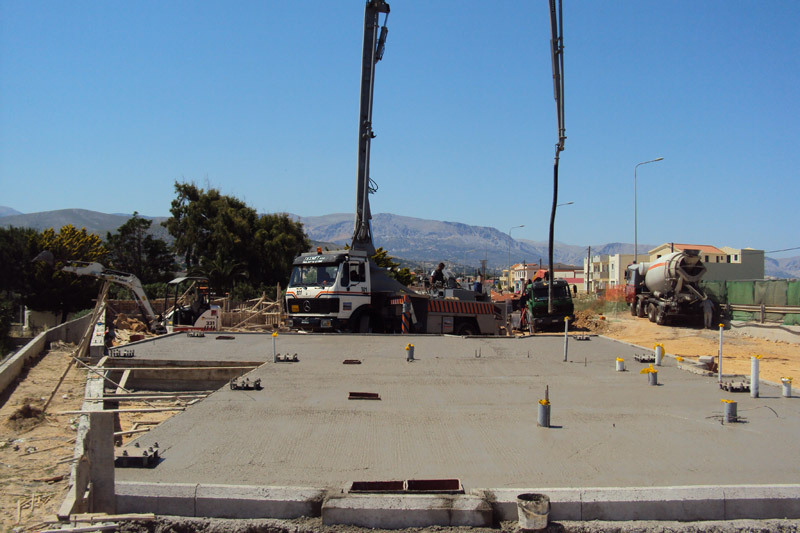 Construction of a new service station of EKO SA stations on the National Road KARPENISIOU-AGRINIOU in Evritania. 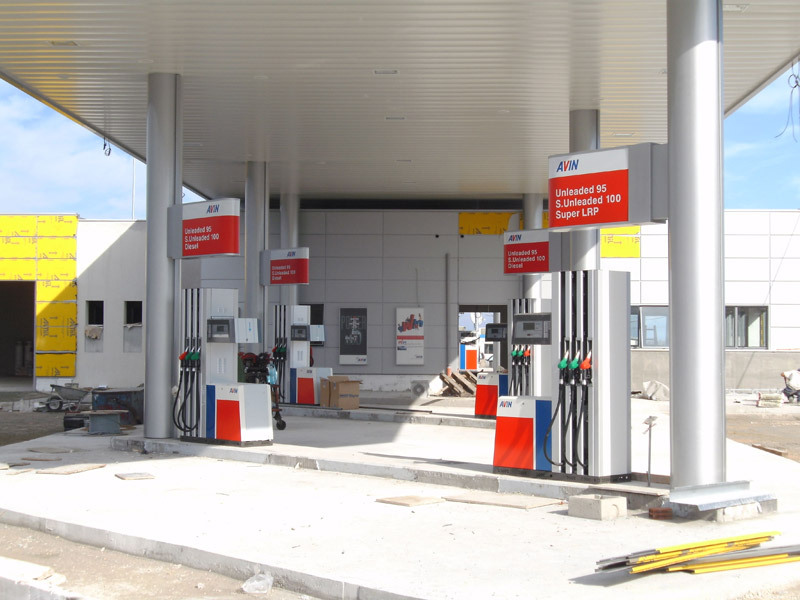 The station was completed “to turnkey” in 110 days in 2009, including a building of 160m2, fueling areas, 192m2 shelters, 5 underground fuel tanks and a surrounding area of 2,400m2. 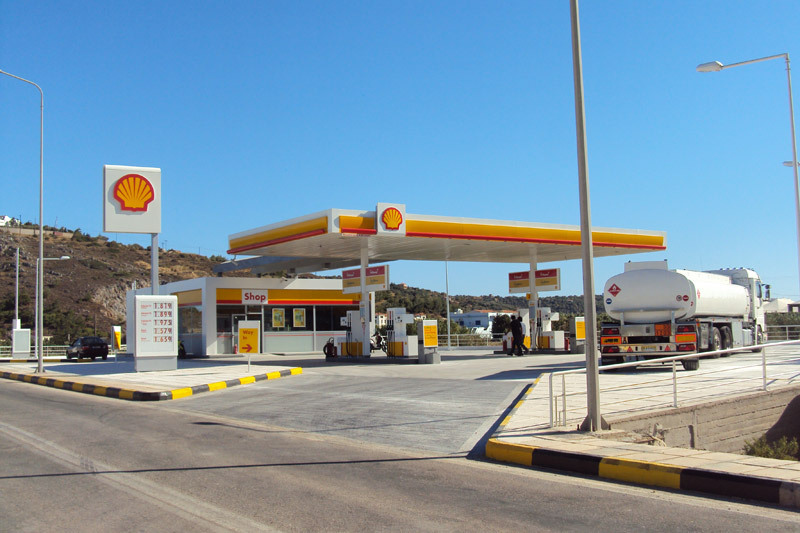 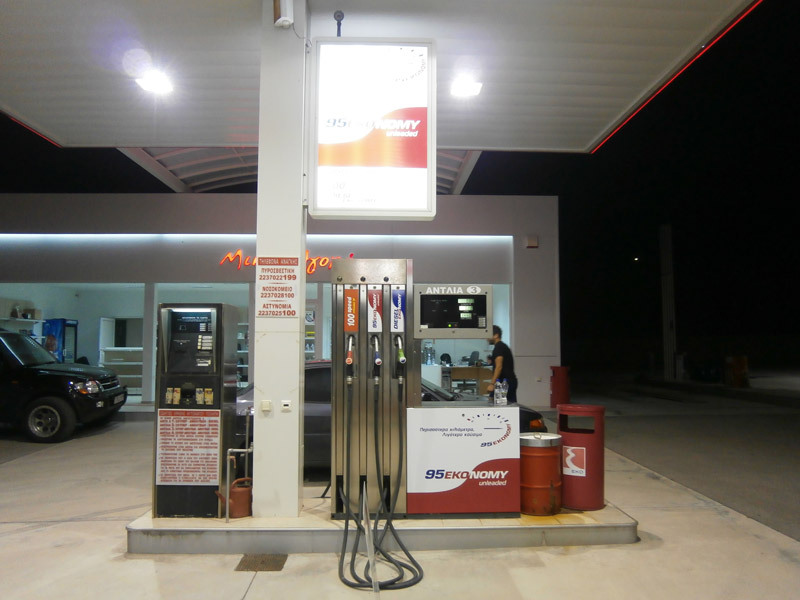 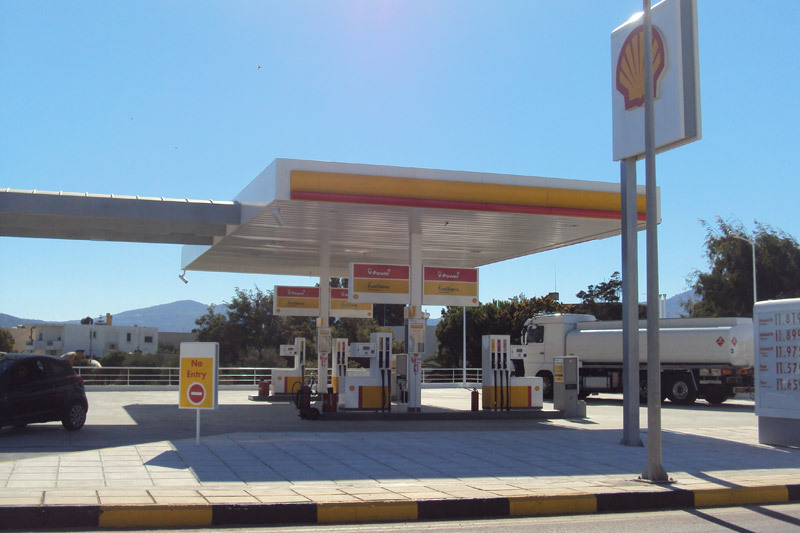 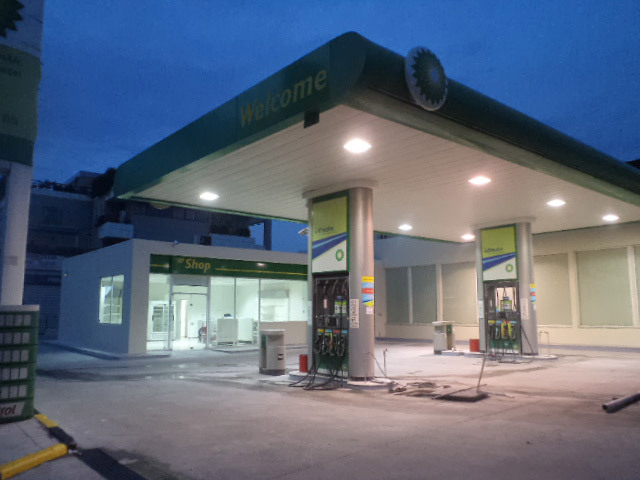 Renovating of the gas station of GREEK FUELS, in the service station located at the 17thkm of ATHENS-CORINTH NR. 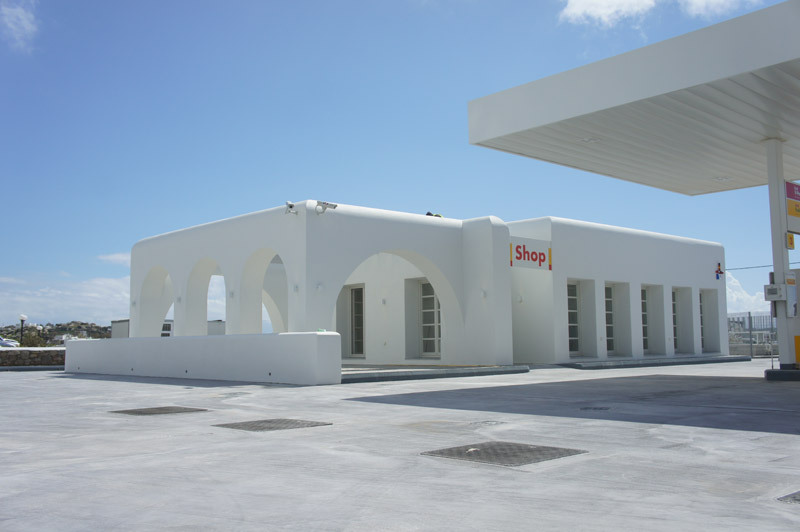 The old car wash was dismantled and reconstructed, along with the salesroom, and many electromechanical and constructional work for the infrastructure of the station were completed. 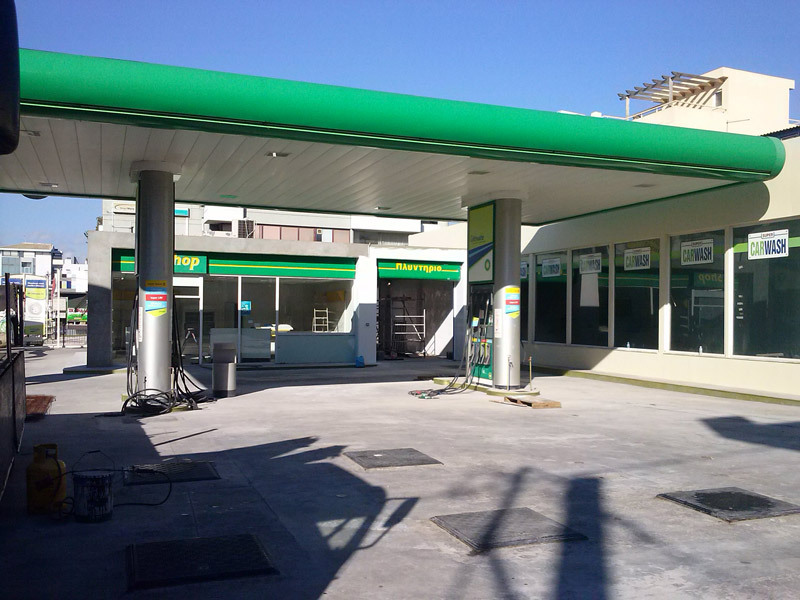 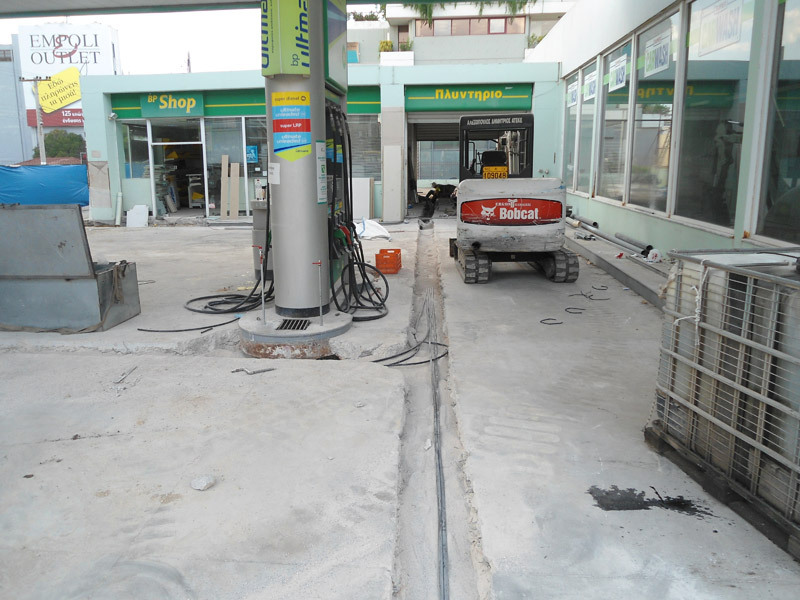 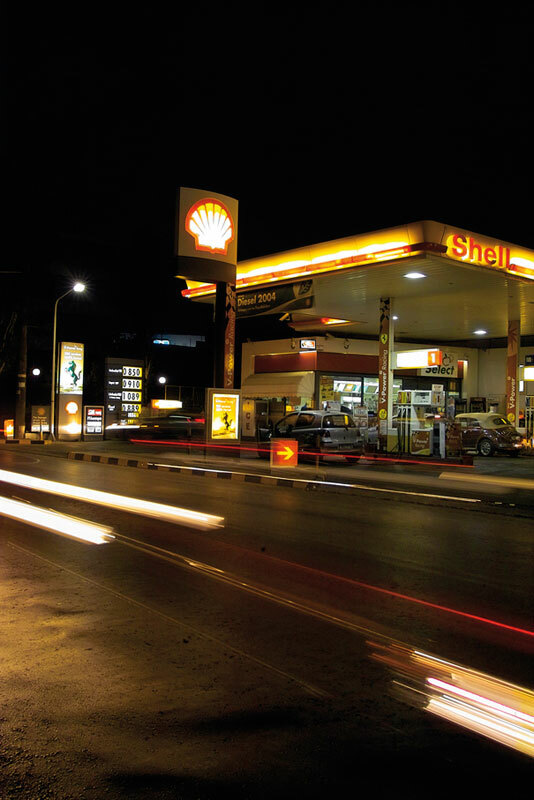 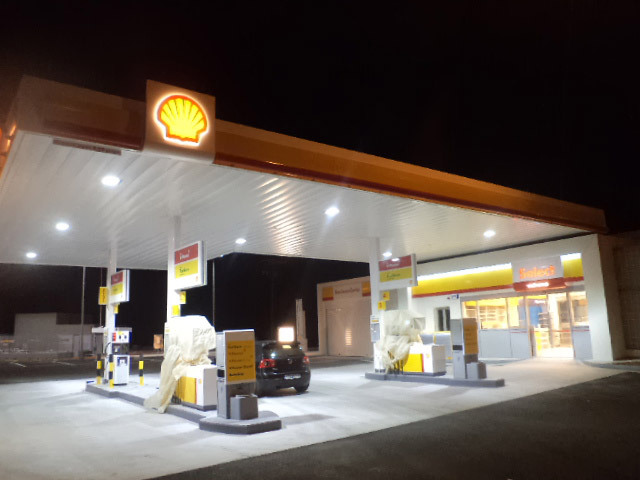 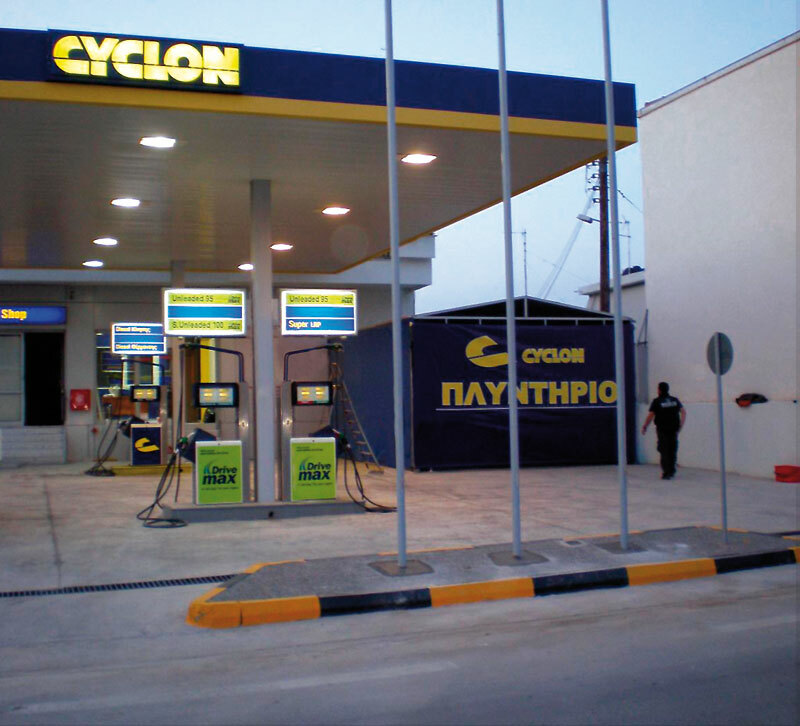 Renovating of the gas station of GREEK FUELS in the service station located in 48 Iphigenia str. 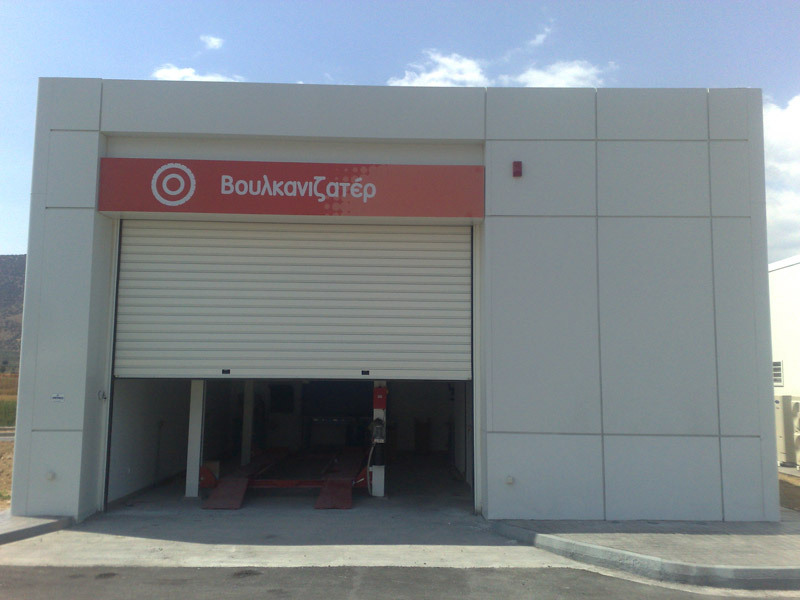 in N.Heraklion. 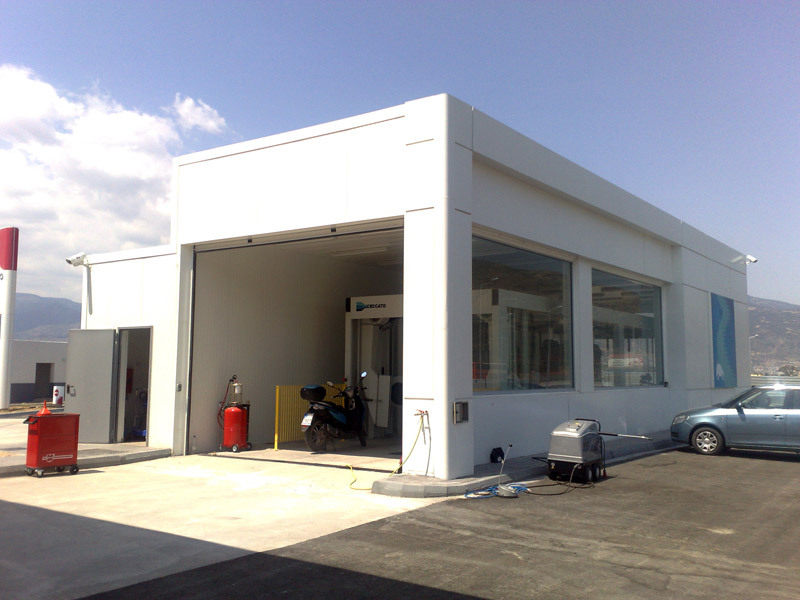 The old car wash was dismantled and reconstructed, along with the salesroom, and many electromechanical and constructional work for the infrastructure of the station were completed. 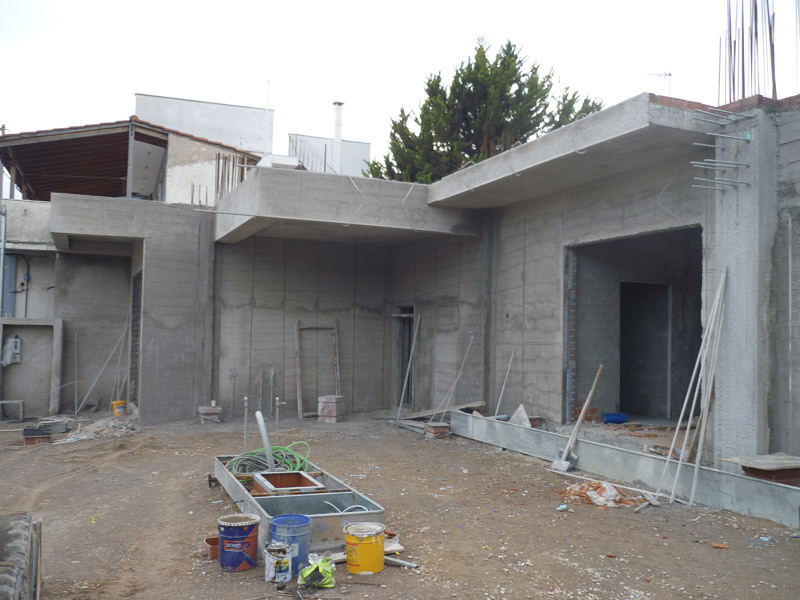 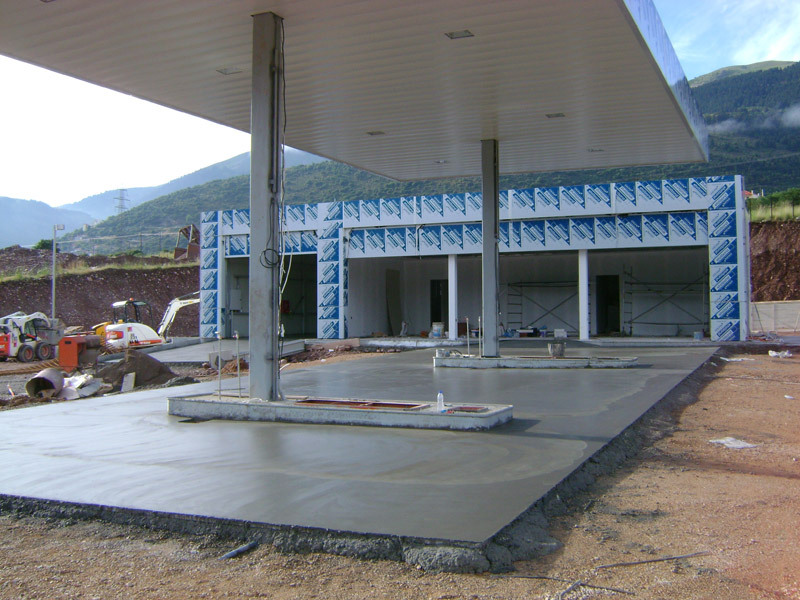 Construction of the gas station in the SAR of AVIN at Leptokaria in 2012. 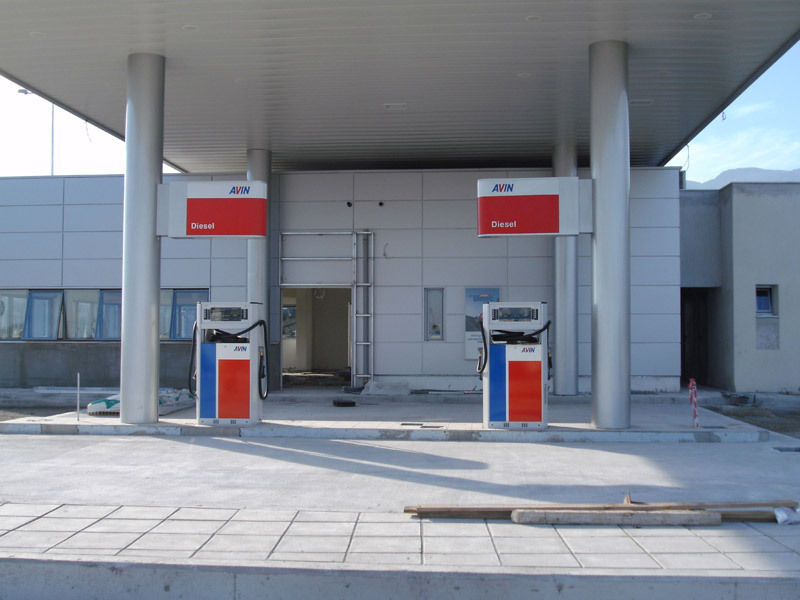 The construction of the gas station in the SAR included the saleroom, the car service station, shelters, electromechanical infrastructure and the area surrounding the station. 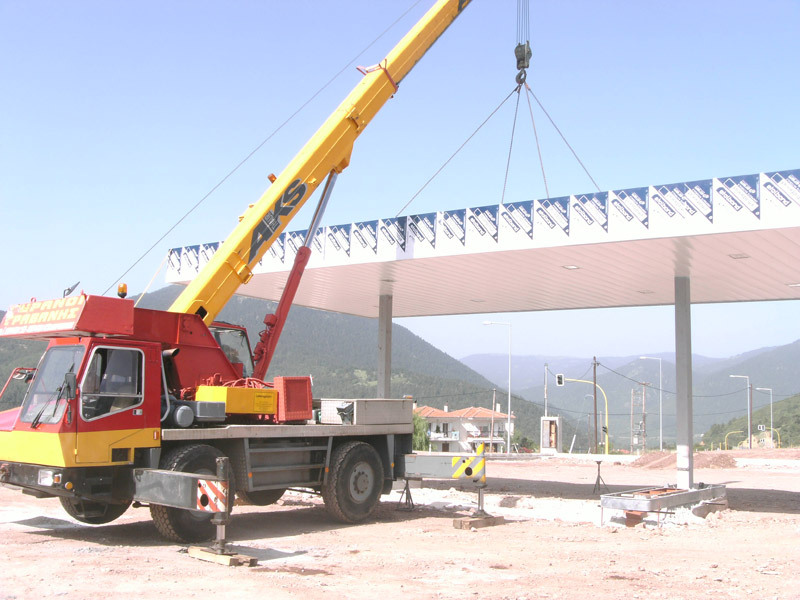 The project lasted only 60 calendar days, one of the fastest constructions of new stations. 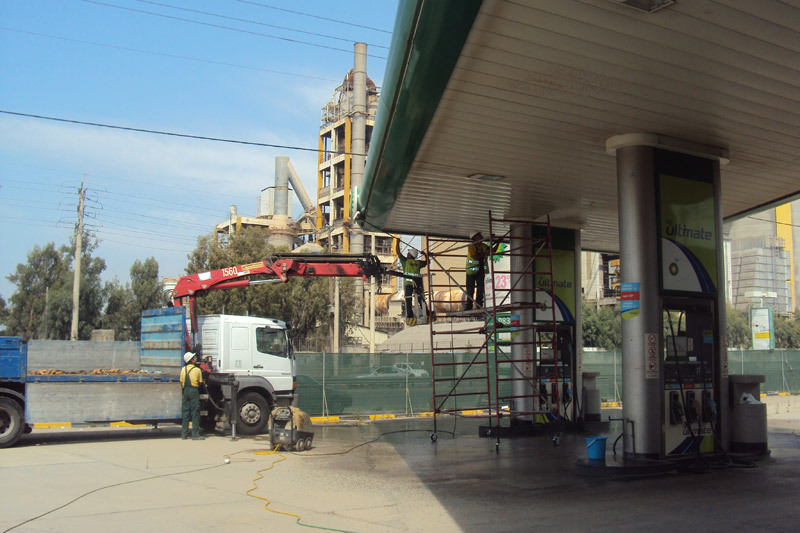 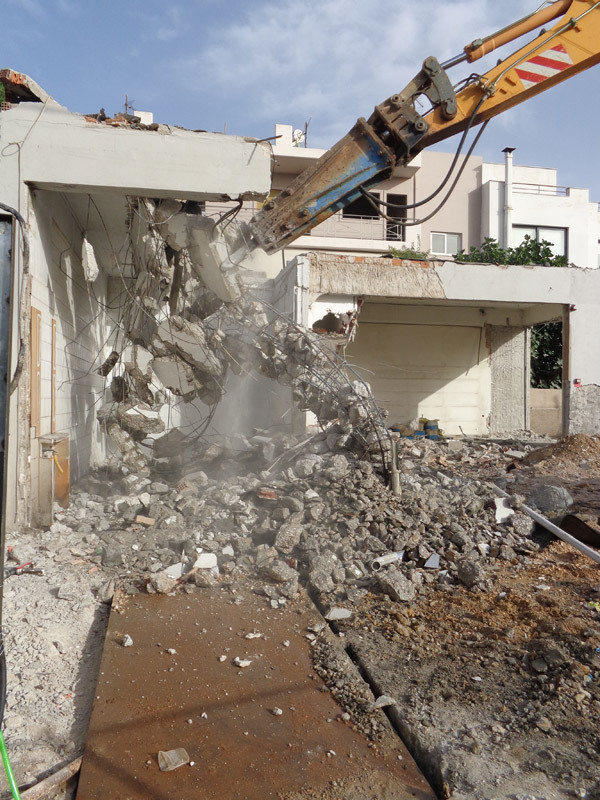 It involved the demolition of the existing car wash, interior masonry, doors of the station, as well as the strengthening of the remaining building and the expansion of the gas station by constructing the premises of the building (shop, staircase) with reinforced concrete, and new indoor spacing. 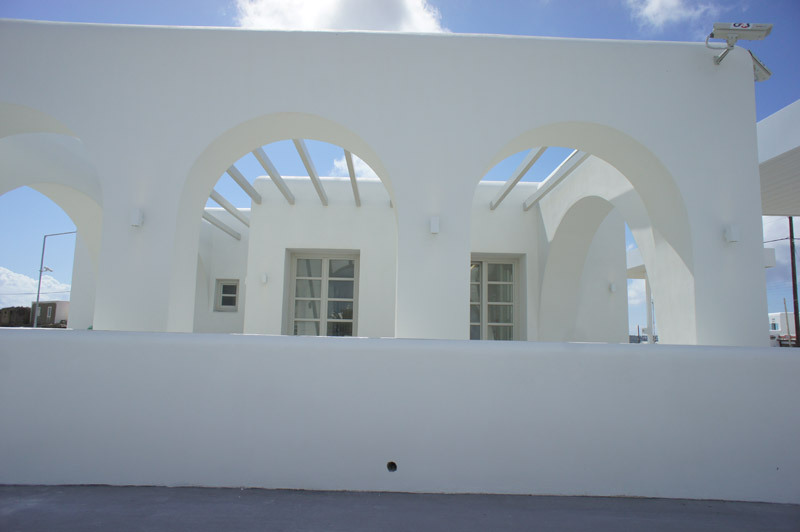 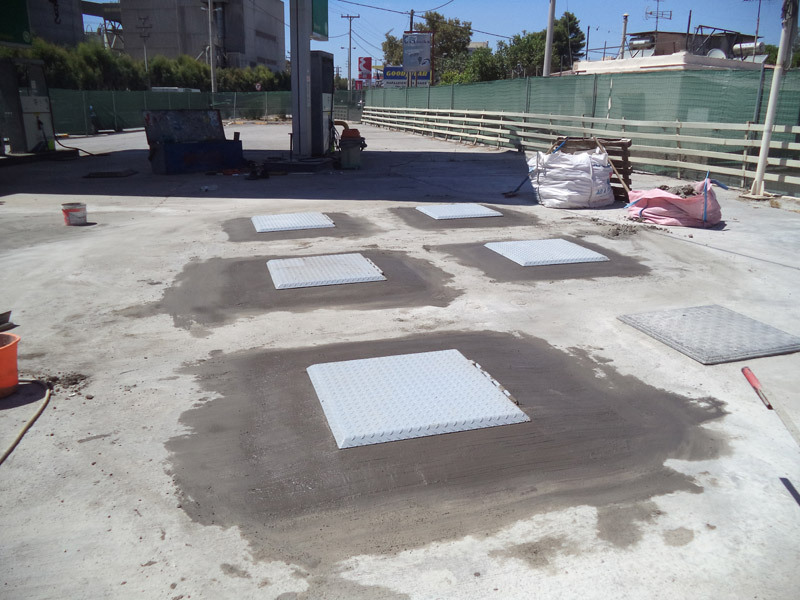 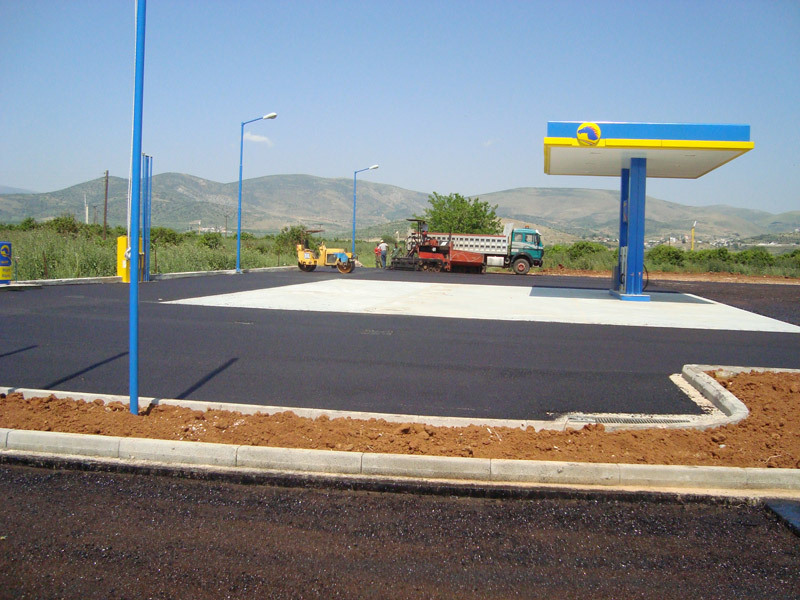 Furthermore, our work include the addition of a new car wash and engine room, the construction of a food service area, restrooms for men, women, as well as accessible toilet, the construction of the ground floor entrance, the construction of new electrical infrastructure, the addition of new islet pump and new pump stations and the construction of new industrial flooring in the Messina gas station in Kymis av. 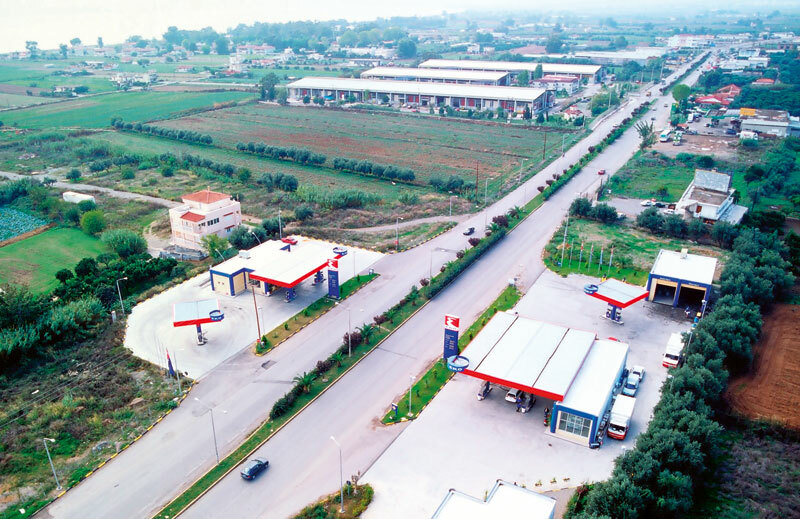 in Nea Ionia. 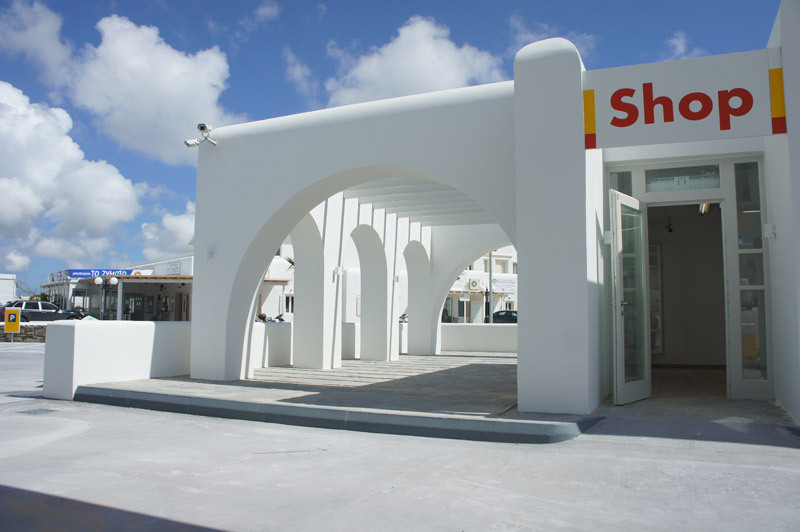 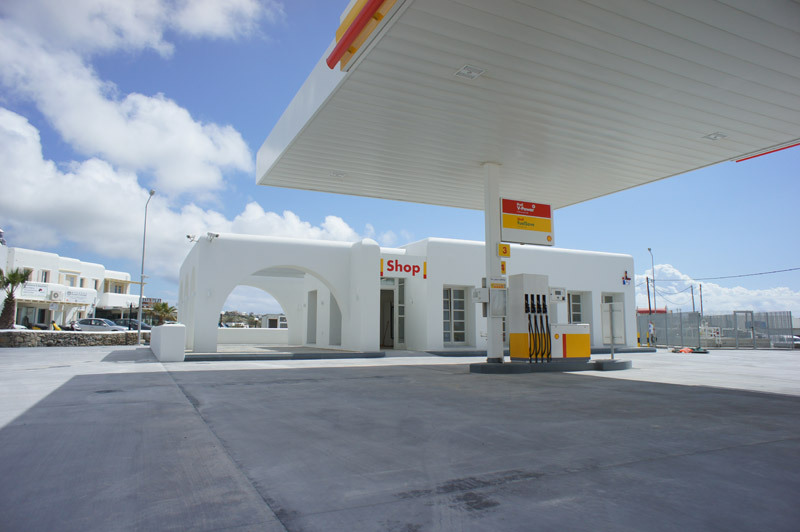 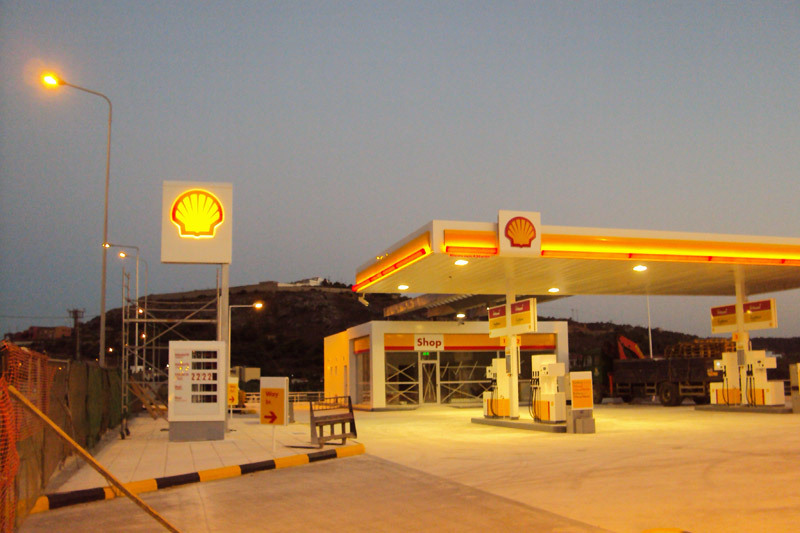 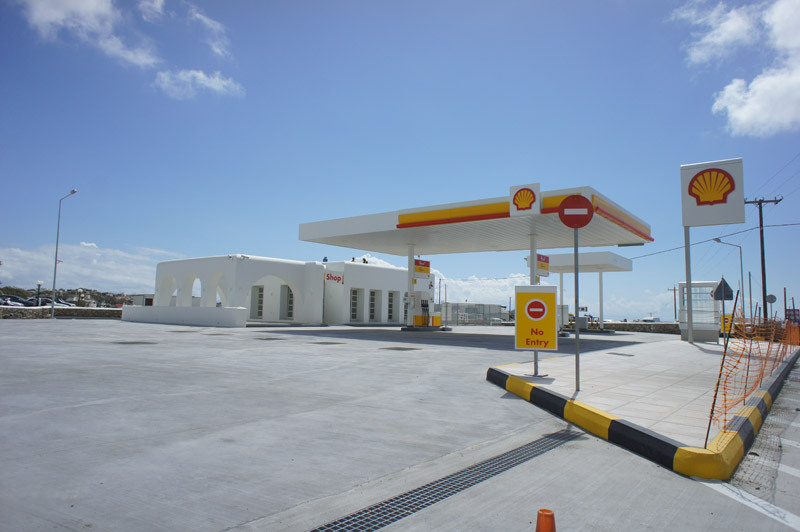 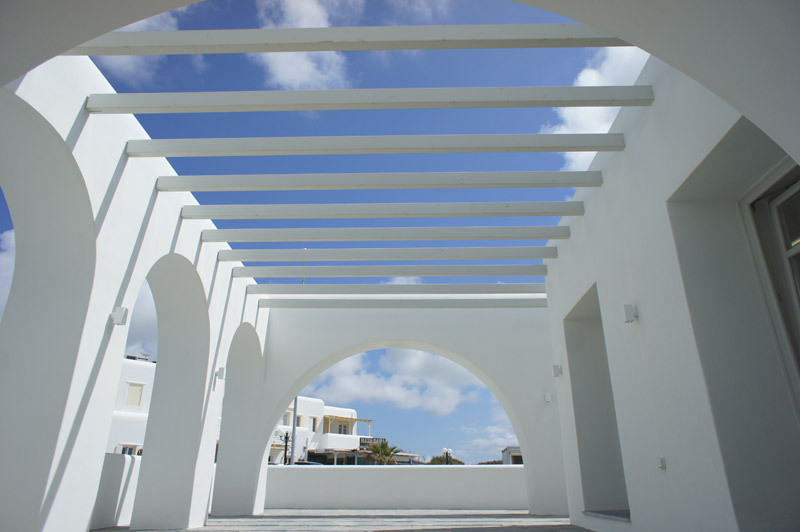 Construction of a new mixed liquid fuel & gas service station for CORAL SA Mykonos. 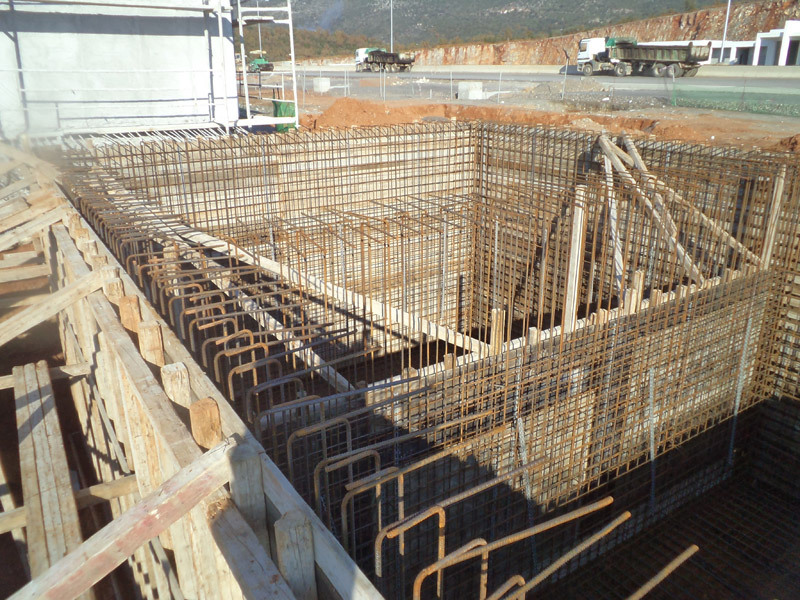 The project included complete landscaping, constructing and electromechanical work for a 120m2 building made from reinforced concrete, including a sales hall, a managerial office, a warehouse, restrooms and a machine room, as well as construction of underground reservoirs of liquid fuel with a total capacity 150m3. 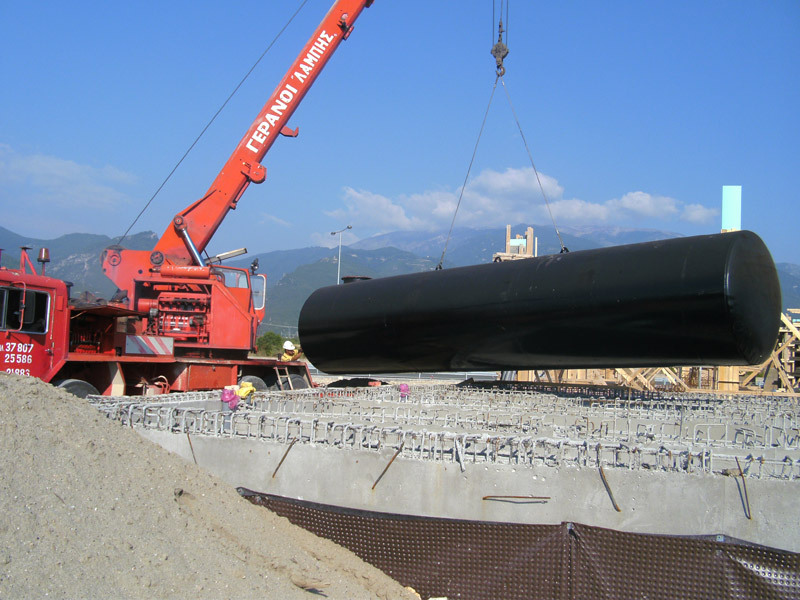 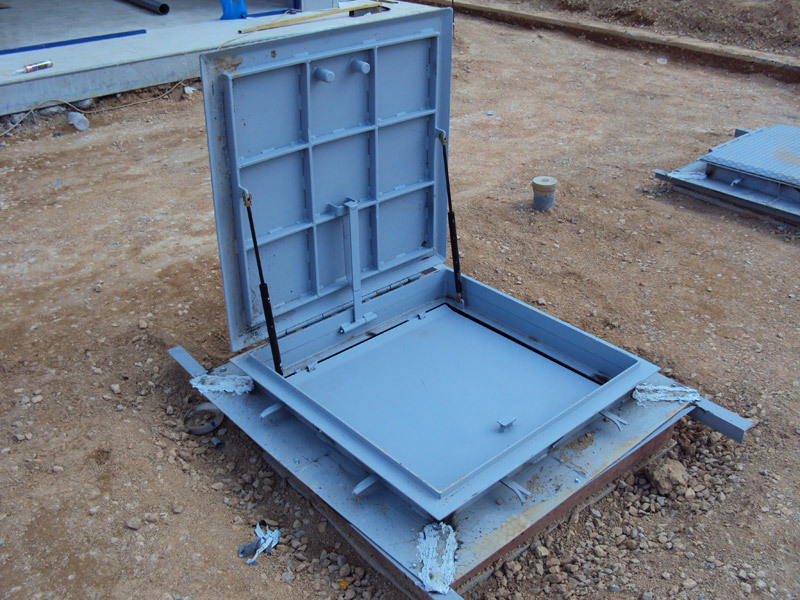 Construction of alveolar gas tank, capacity of 18m3. 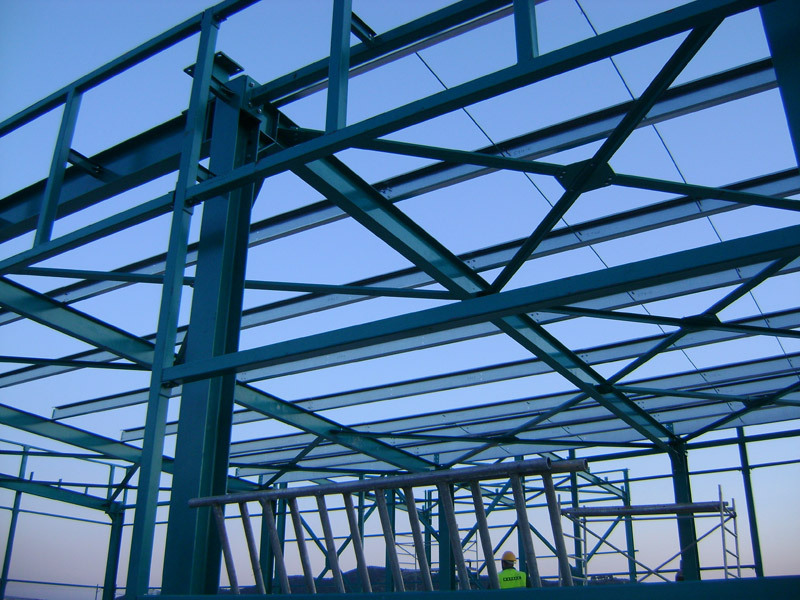 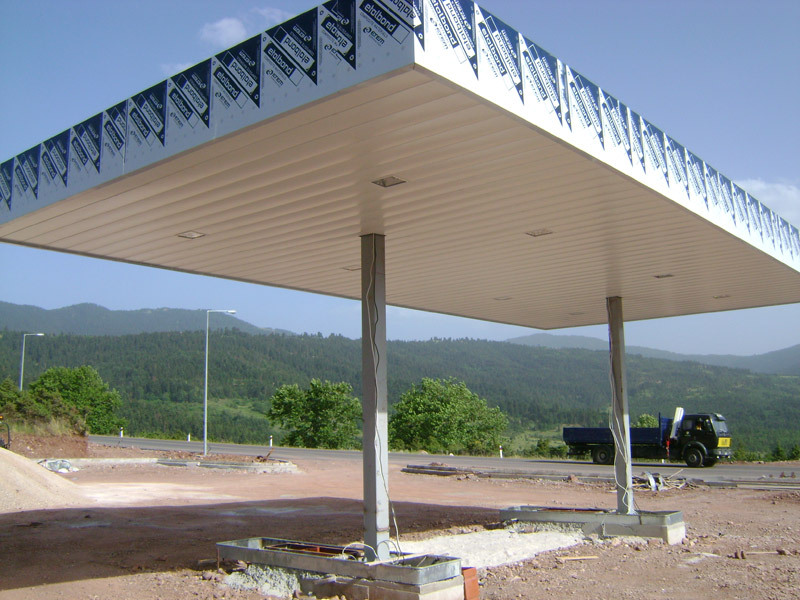 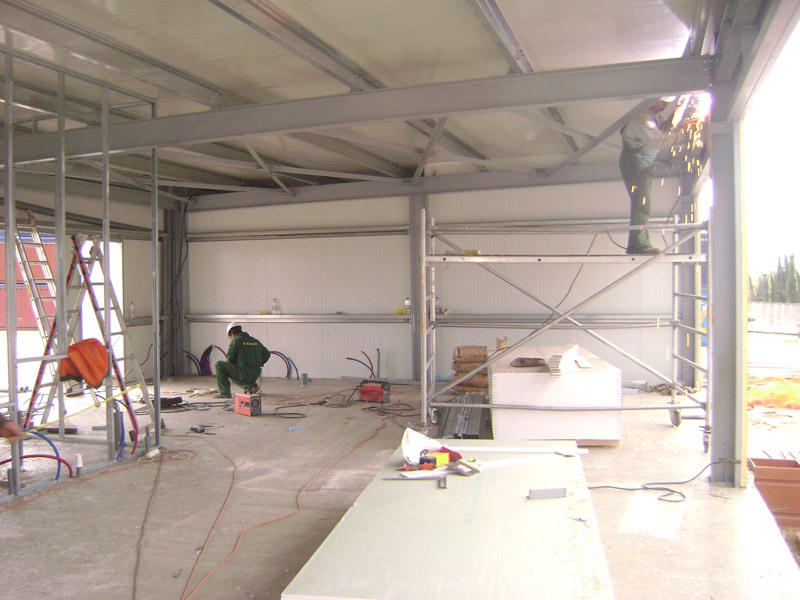 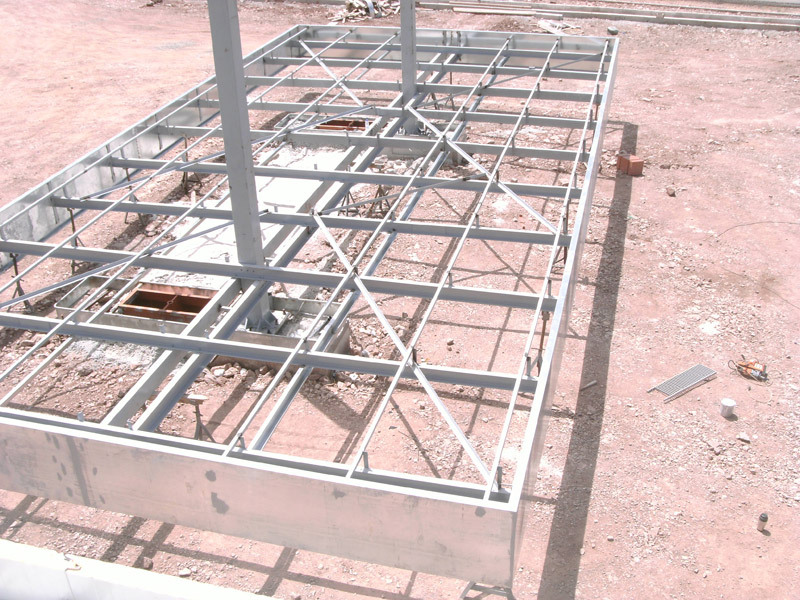 Construction of gasoline and diesel supply stations for cars and trucks, with a 135m2 metal roof. 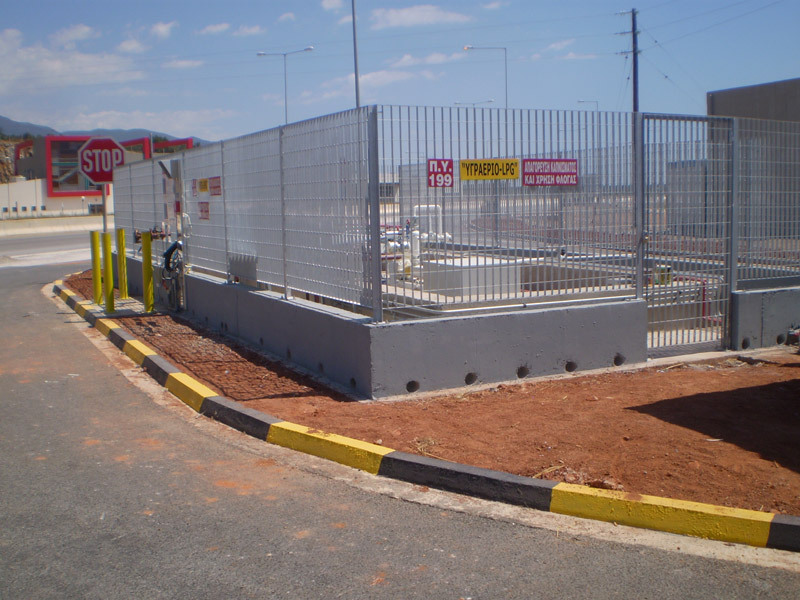 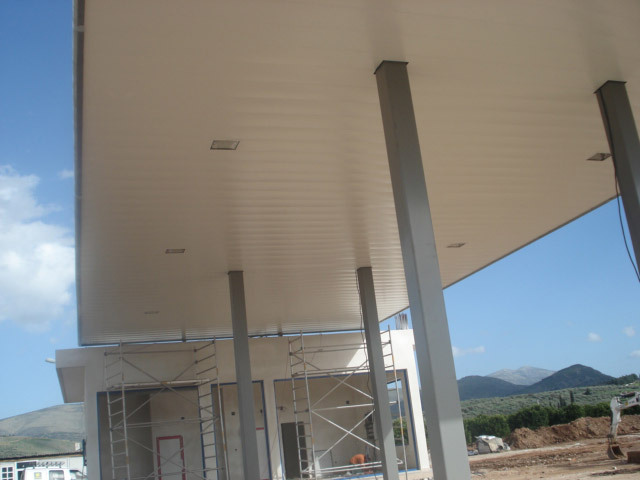 Gas supply area for cars and trucks with a 36m2 metal roof. 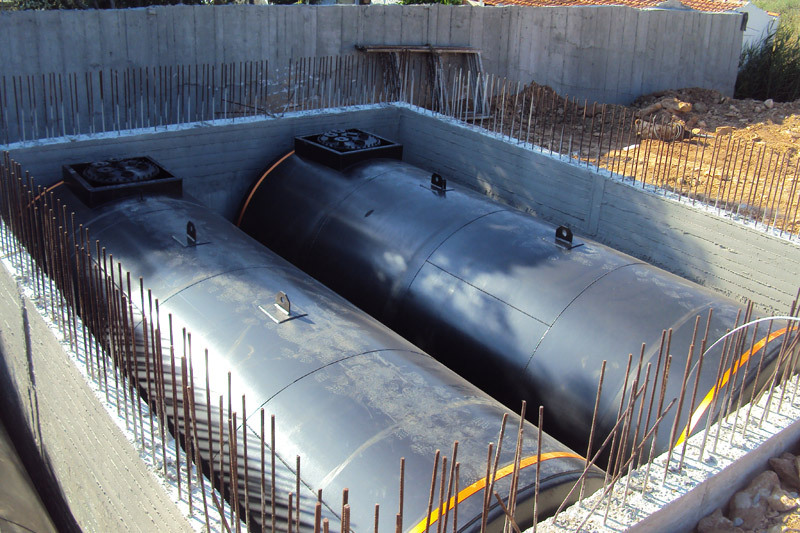 Heating oil supply area. 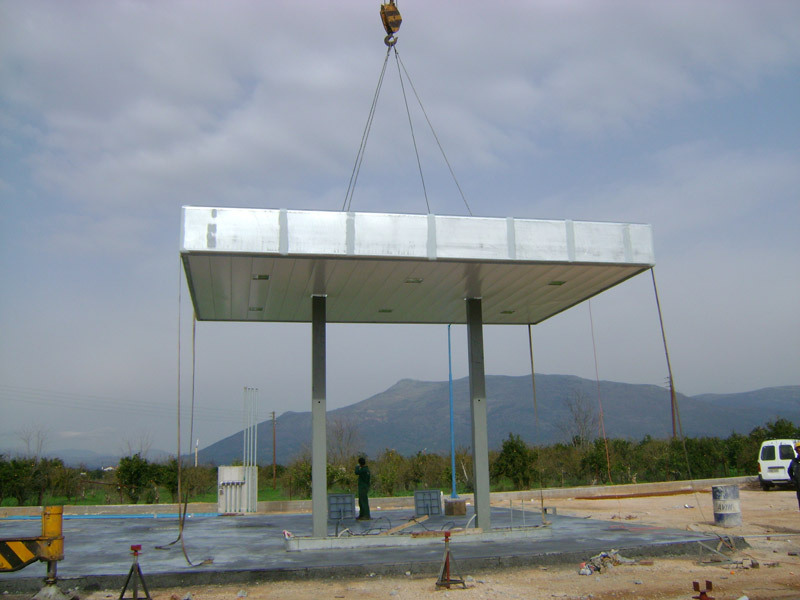 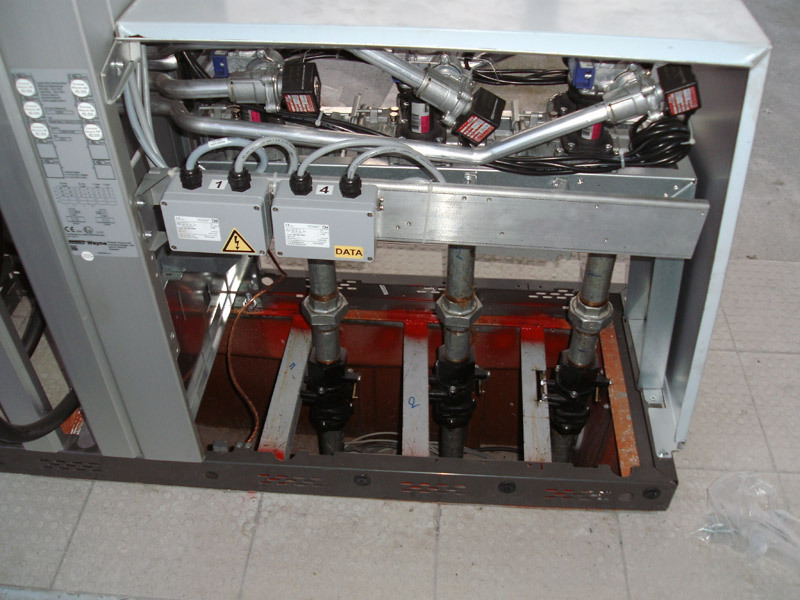 Infrastructure and electromechanical projects. 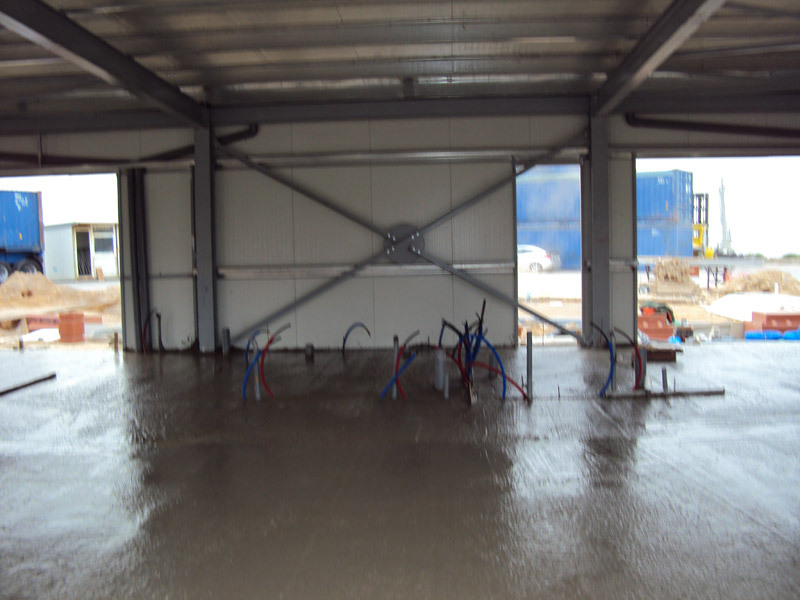 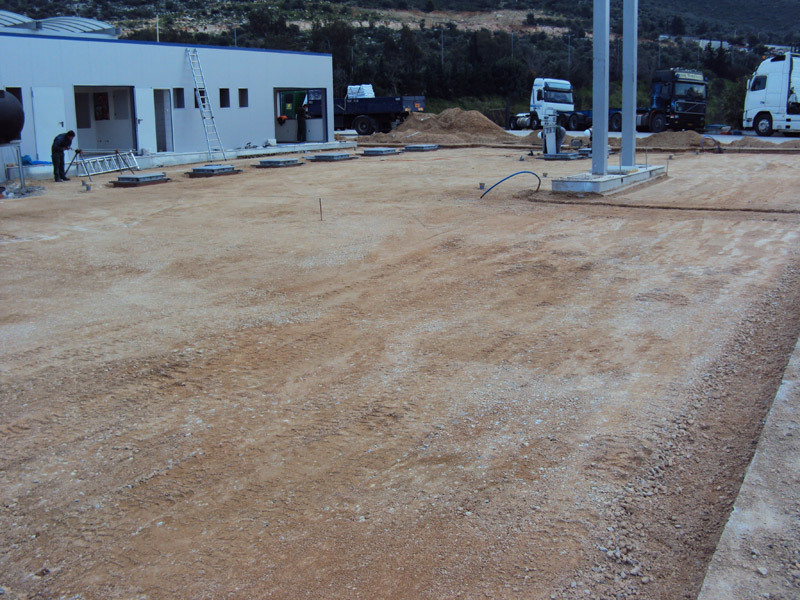 Construction of a 2,500m2 square and processing of industrial floor. 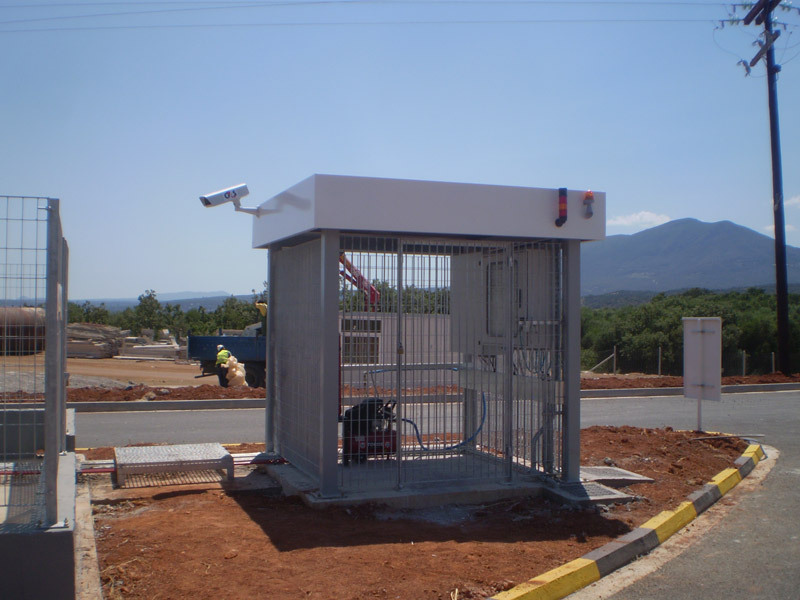 Junction infrastructure and traffic connection station. 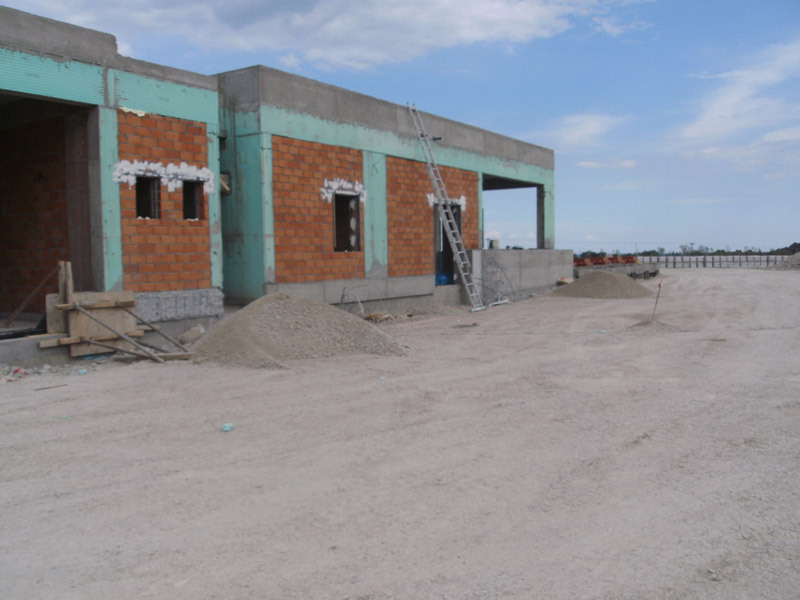 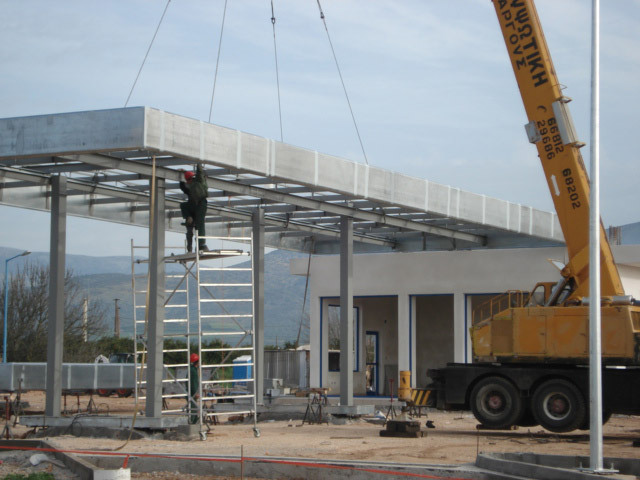 Construction of a new service station on the provincial road CHIOY-Mesta in 2012. 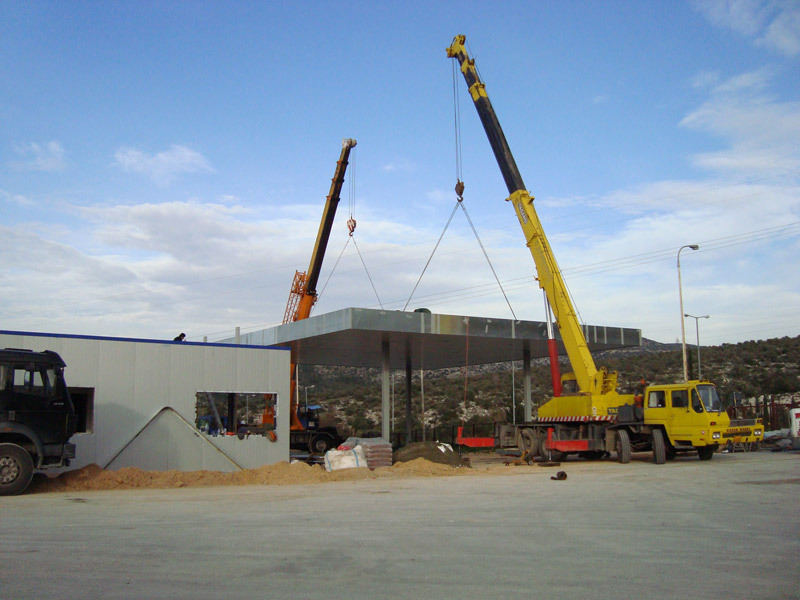 This study and construction/contracting regards construction and electromechanical works for the creation of the entire station, namely the construction/completion of the building with reinforced concrete, construction of roof metal bases, construction of subbase and foundation, construction of boxes of underground tanks made of reinforced concrete, and installation of tanks, construction of islets of the distributors of the service station and the installation distributors, construction of sewerage and electromagnetic networks, construction of industrial flooring of the premises of the service station, construction of traffic connection, and construction of the shelter and the surroundings of the station according to the plans and technical descriptions/specifications of the project. 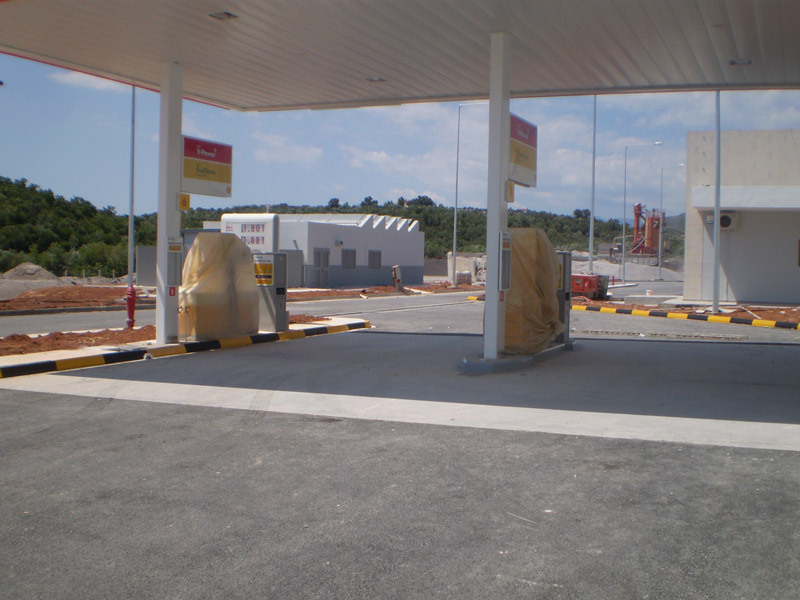 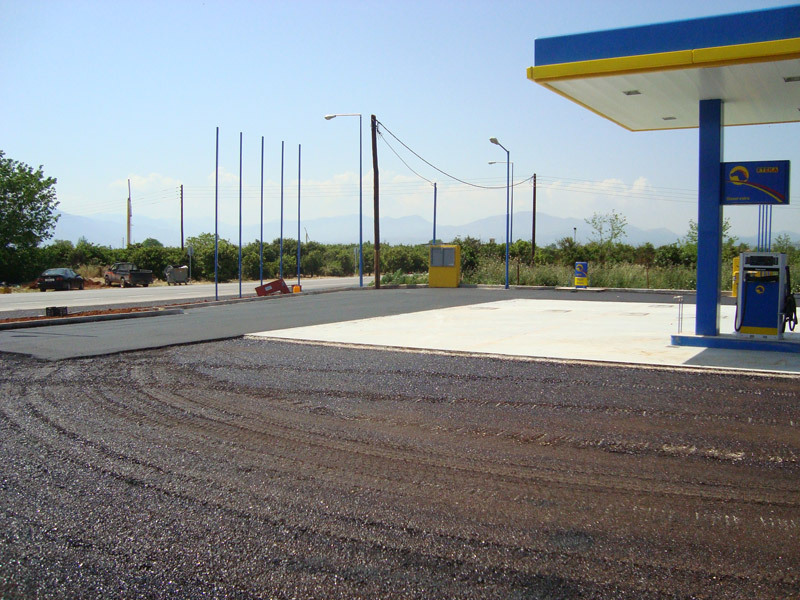 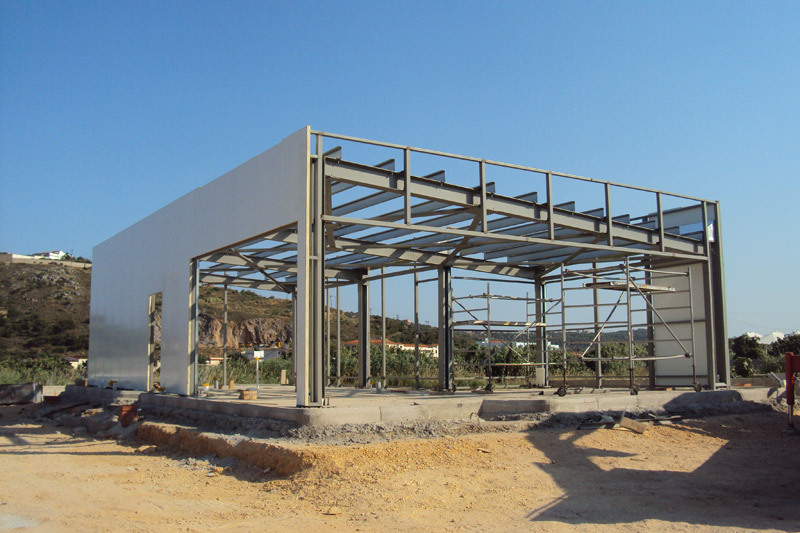 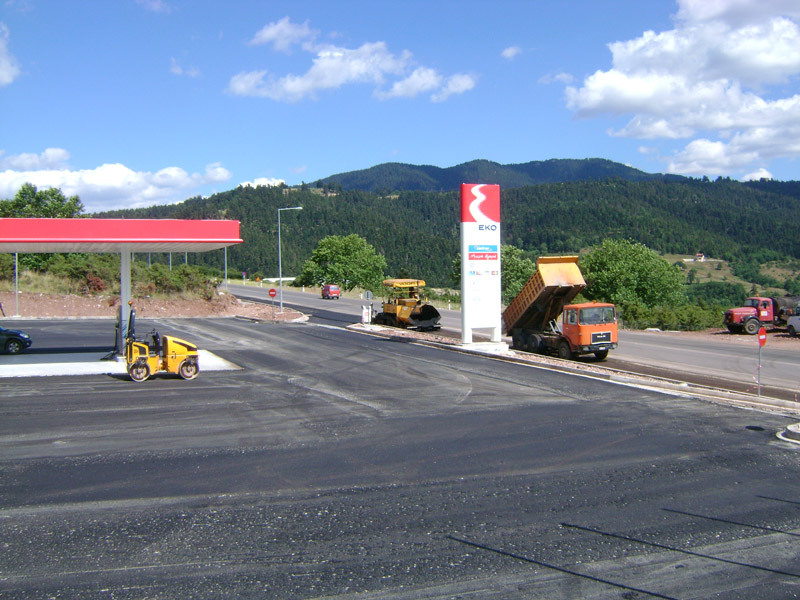 Construction of mixed service station for CORAL Oil AE in cooperation with MOREAS SA Motorist Service Station in the region of Messinia Arfara, in 2011. 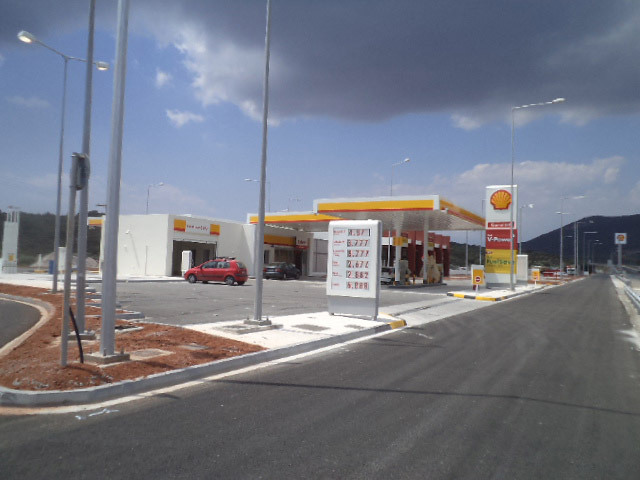 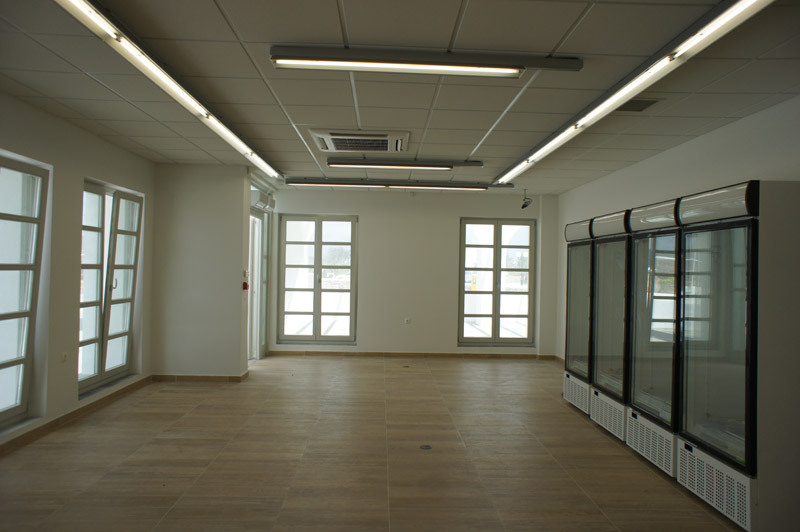 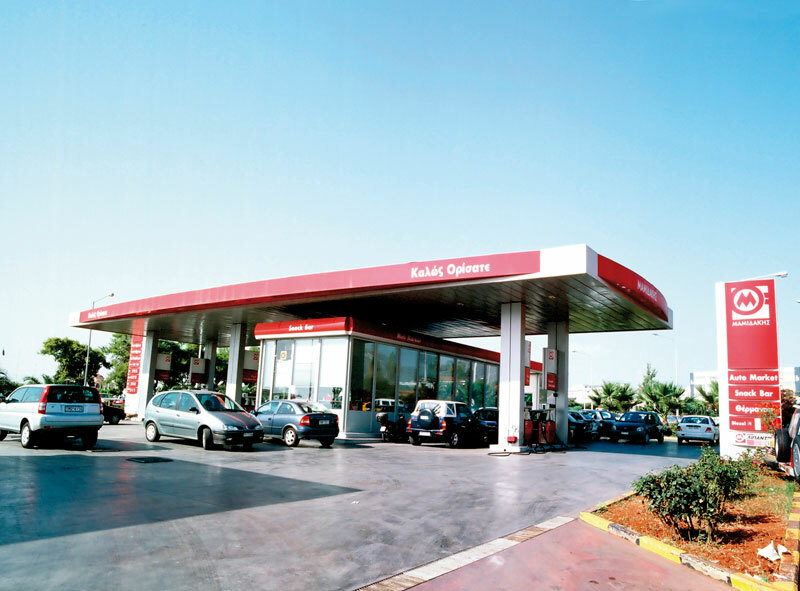 The station is located in the section of the new Corinth – Tripoli – Kalamata highway CH 219. 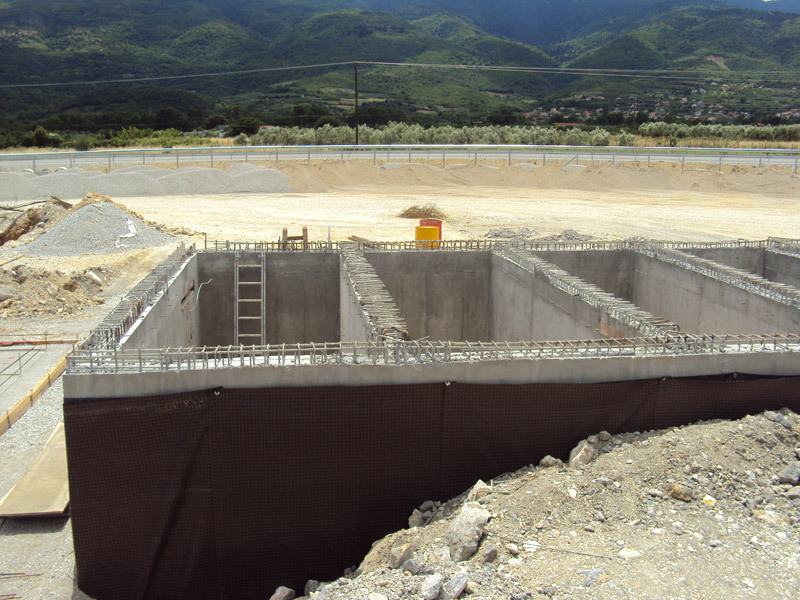 Construction of a new petrol station of ETEKA at Mycenae in 2012. 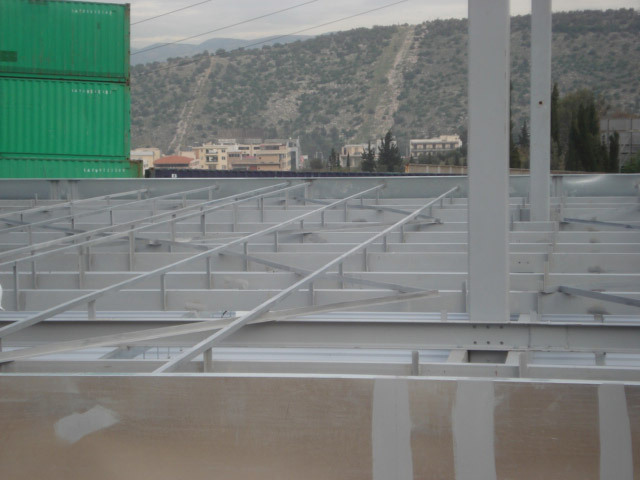 The project included complete landscaping, constructing and electromechanical construction work for the building with reinforced concrete. 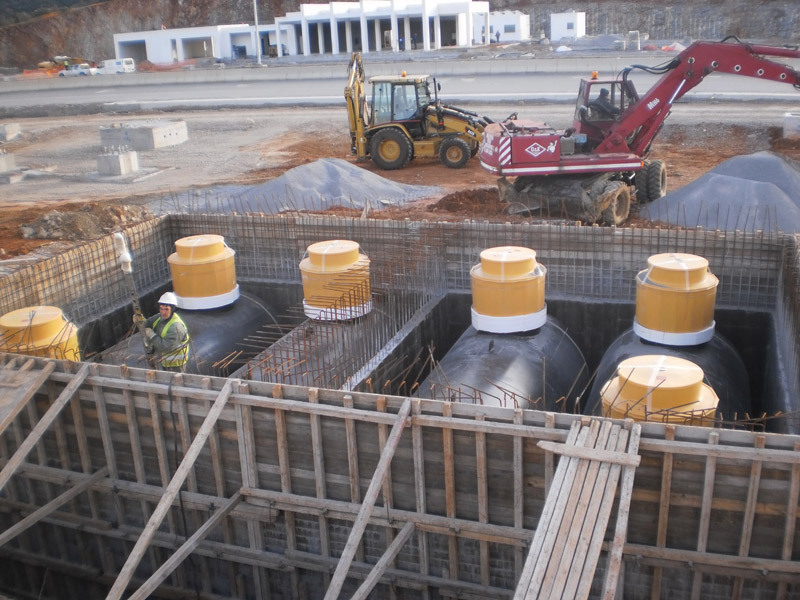 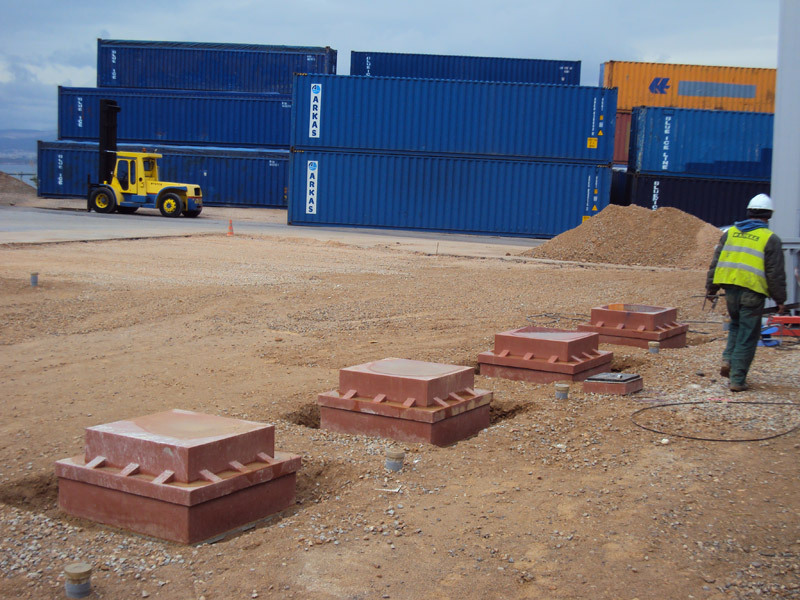 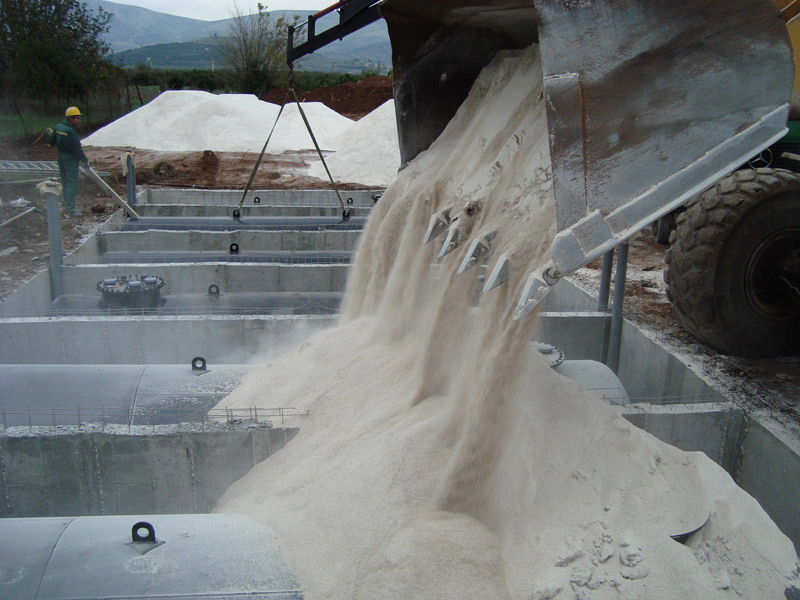 Construction of underground well reservoirs for liquid fuels. 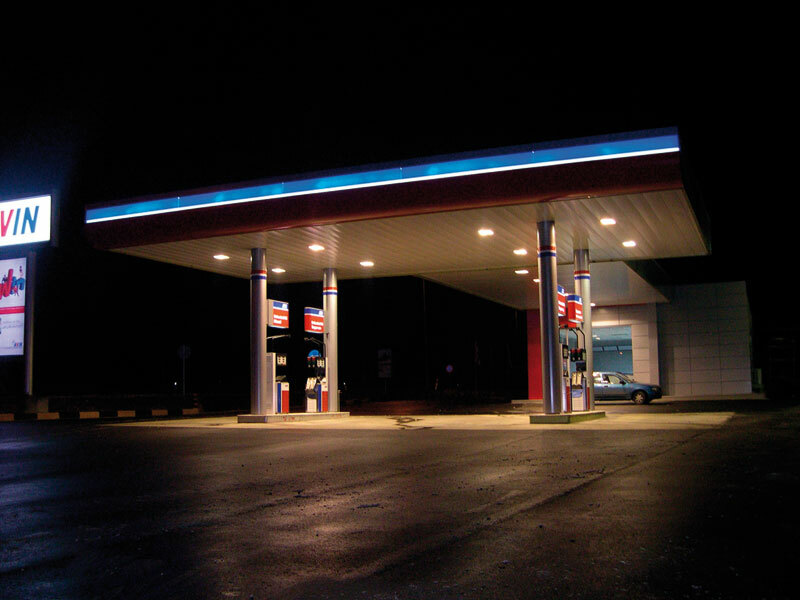 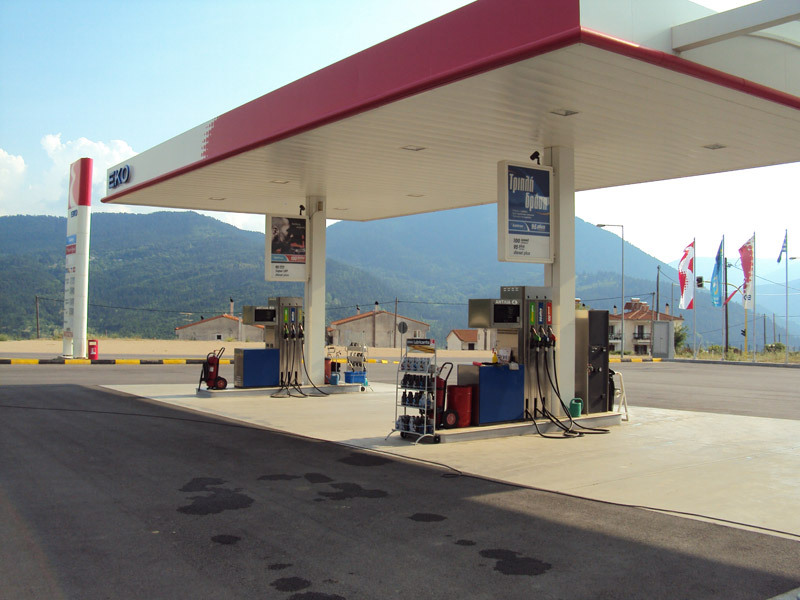 Gasoline and diesel supply areas for cars and trucks with a metal roof. 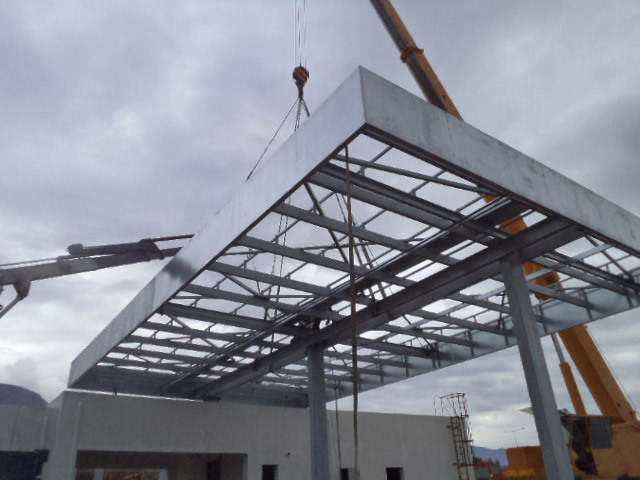 Infrastructure and electromechanical projects. 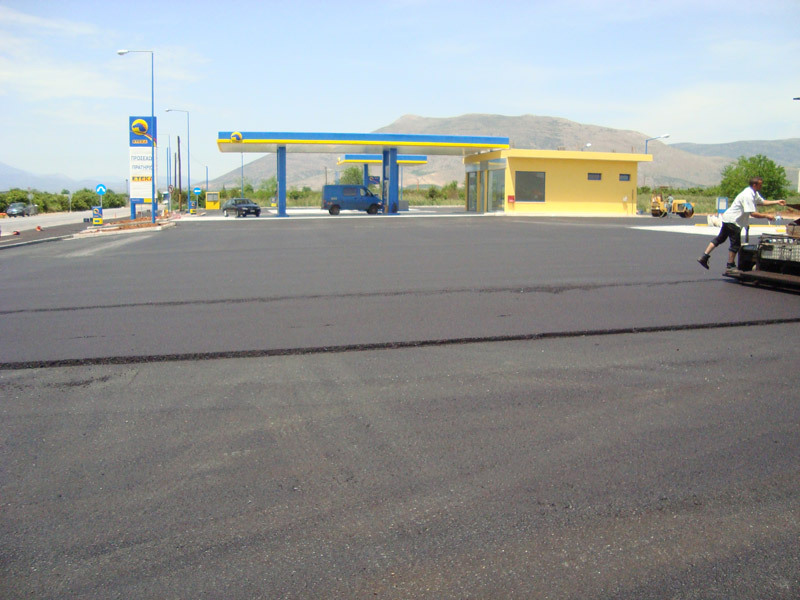 Construction of a 3,500m2 square from asphalt. 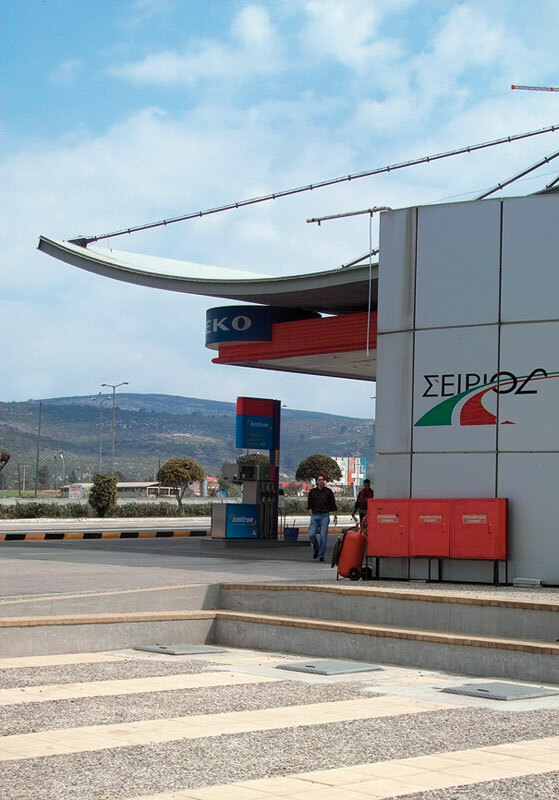 Junction infrastructure and station traffic connection. 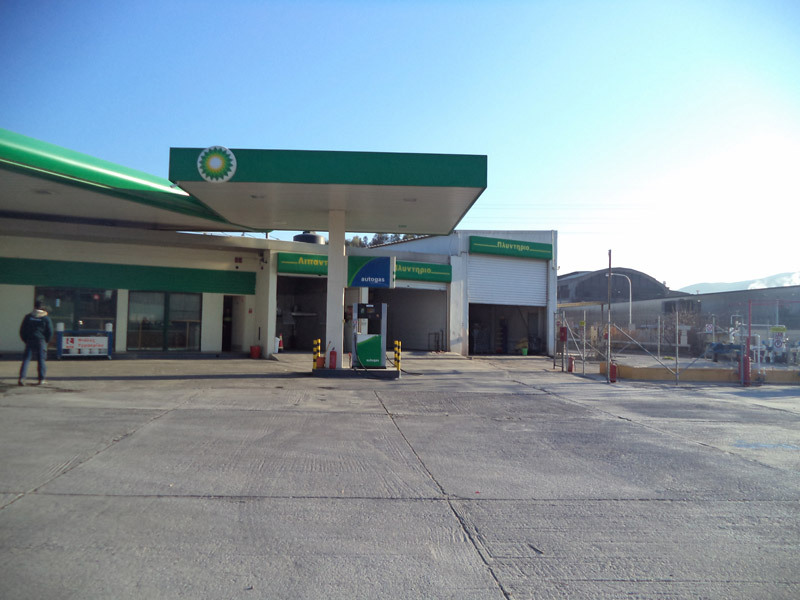 Construction of a new petrol station and food service shop. 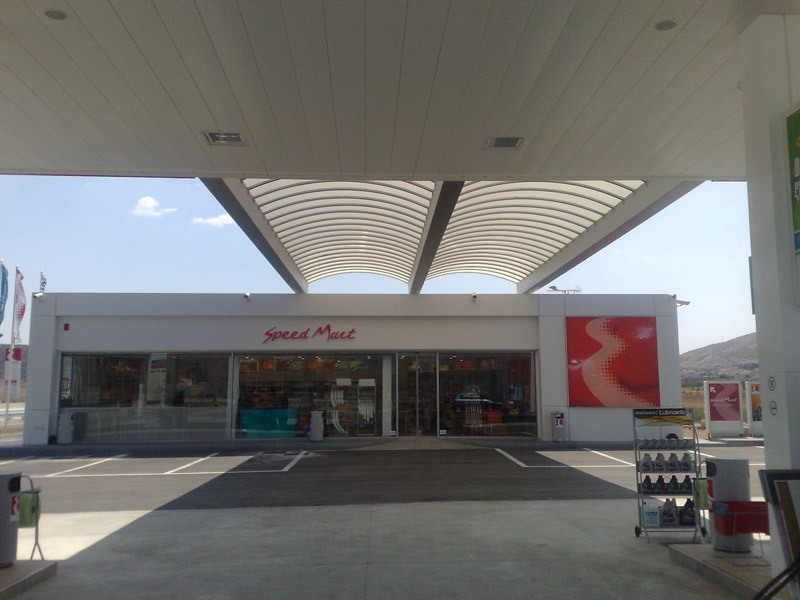 The peculiarity of the station included a 4column shelter of 19 x 16 dimension whose building was set up in the ground with a single leaf ceiling canopy alongside the 16m side. 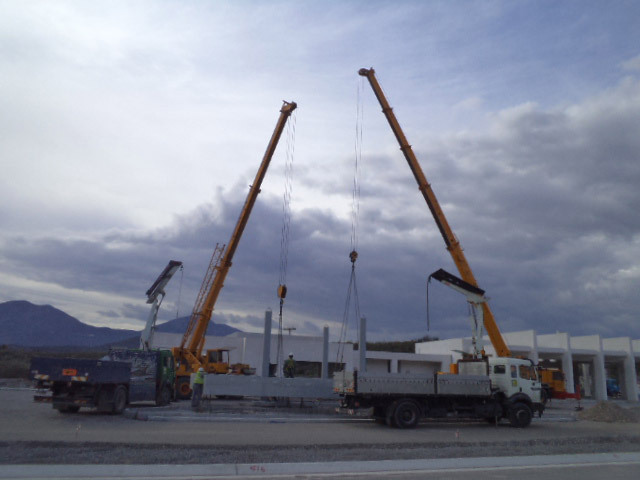 Two telescopic cranes were used for its construction.